My Great-grandfather, William Robson (1816-1920) Jnr. 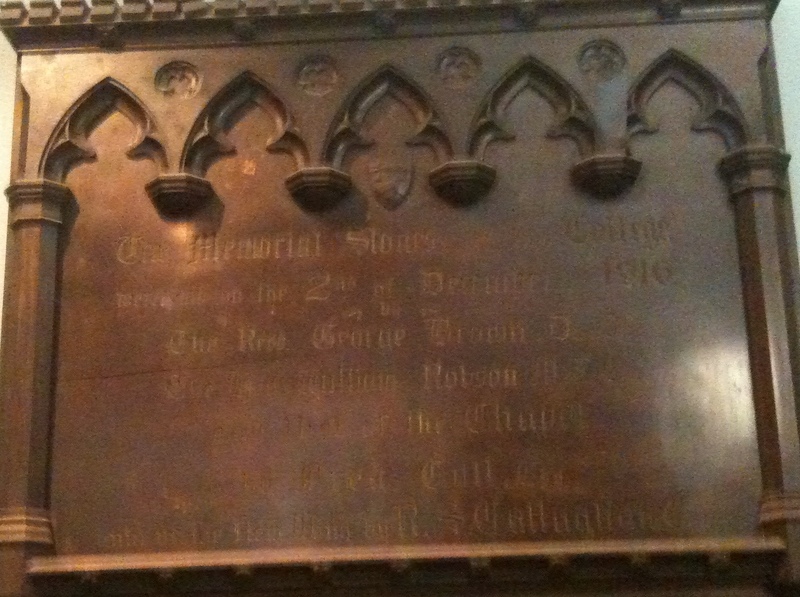 was the son of William Robson Snr. (1817-1888) and Ann Veitch (1816-1853). 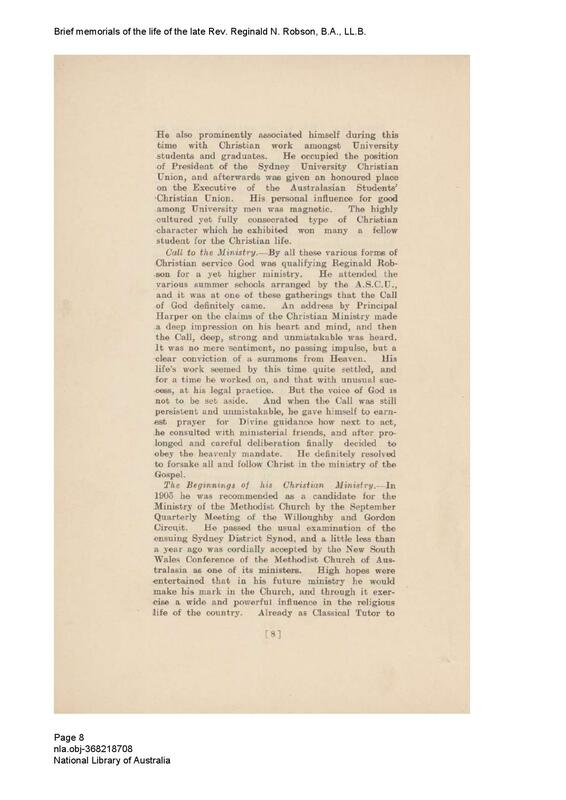 He was a staunch Methodist, like his father, and he became a Reverend in the Methodist Church, shortly before his marriage to Annie Robertson Kippax. 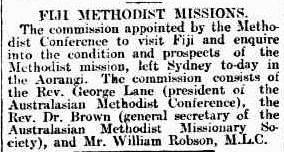 I am sure that William met Annie in Sydney when he was attending Methodist gatherings and conferences. Reverend William Robson, J.P., M.L.C. Annie’s father William Henry Kippax was also a staunch Methodist and a Sydney City Councillor for many years. 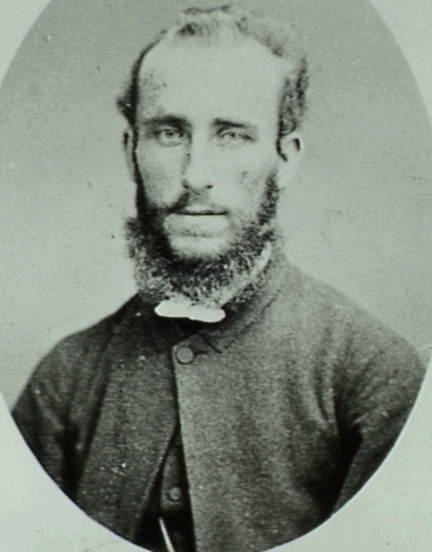 William Henry Kippax was also very active in his church and in the Temperance Movement, in a bid to encourage young men to join the church and promote abstinence. 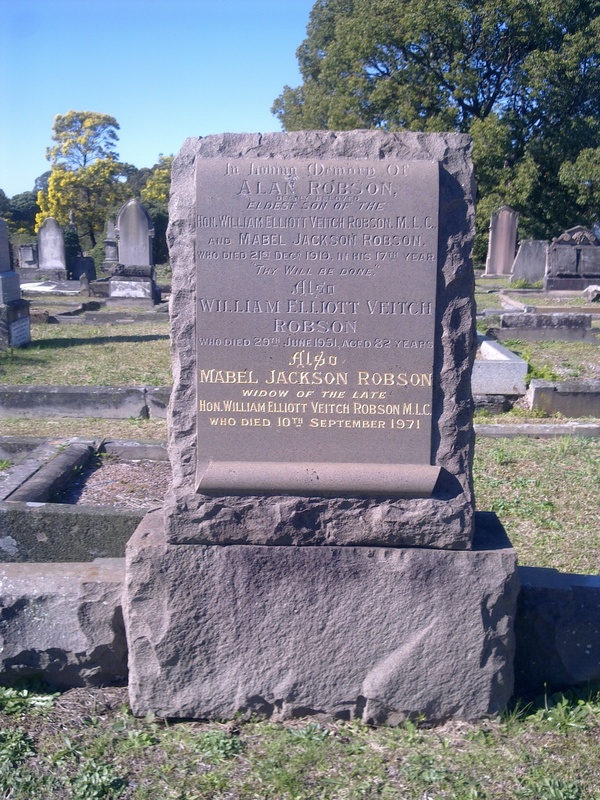 William Robson would have trained in Sydney, in order to qualify as a Methodist Preacher. In other chapters I have written up the Kippax and Robson family chapters and mentioned the close connection between them. William was born in the Hunter River district of New South Wales and his birth was registered in Newcastle in 1843. 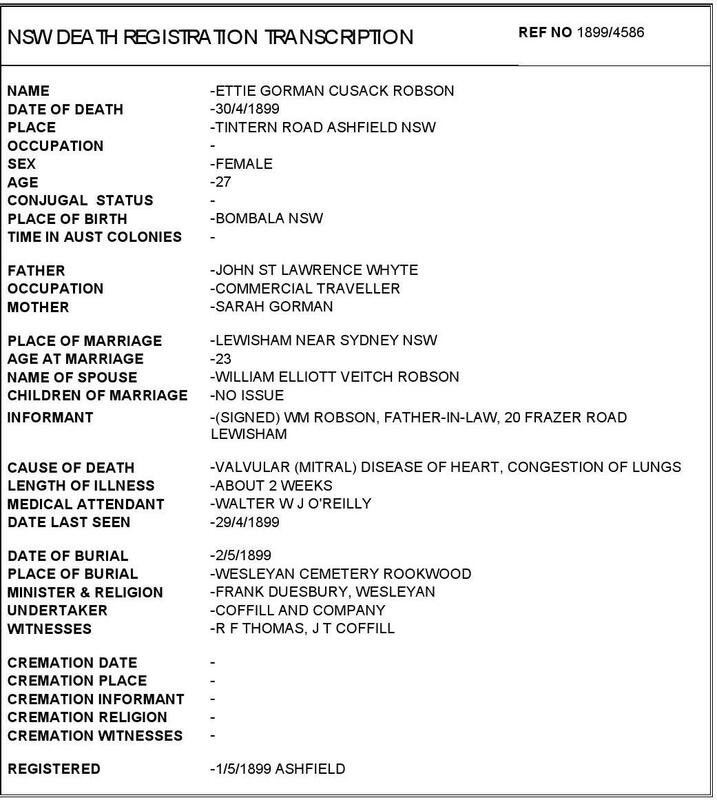 As I mentioned in The Robson Family of Newcastle and Wollongong, William’s birth record was elusive due to the fact that it was wrongly registered in the name Robinson. William’s mother Ann Veitch died in Maitland, New South Wales, on 15 September 1853 when William was only nine years of age, and the family later moved to Wollongong, New South Wales, when his father leased the Mount Keira Colliery in the late 1850’s. His father had remarried Margaret Wiseman nee Elliott, a Maitland widow on 7 January 1854 just three and a half months later. Margaret Wiseman nee Elliott (1824-1896) had four children from her first marriage to Thomas Wiseman. 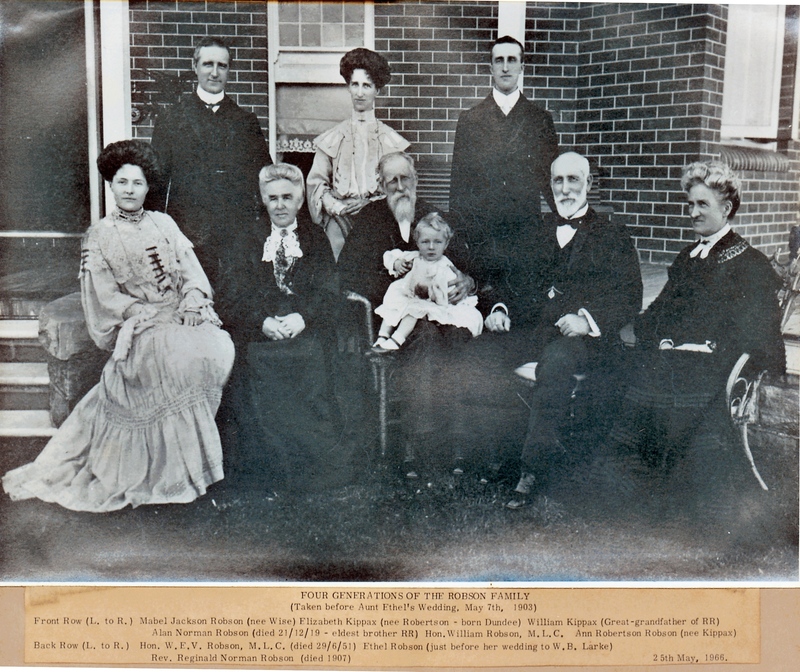 William and Margaret Robson also had a large family of nine children together. William Robson Jnr. was close to his step-mother, and must have enjoyed a chaotic but close and warm relationship with his siblings, step-siblings and step-siblings. In 1869, as a tribute to his two mothers, William named his eldest son William Elliott Veitch Robson. I found this to be a very touching gesture, and one that reflected the respect he had to the two most important women from his childhood. The Robson family is large and complicated. The next page is helpful as I have set out a summary of William’s brothers and sisters from his father’s first marriage to Ann Veitch. Later in this chapter I will deal with Ann Veitch’s family from Northumberland. Thomas William Robson, was born in December 1837 in Wallsend, Northumberland. He died on 21 June 1840 in Newcastle upon Tyne, Northumberland, England. Margaret Robson born 1838, who accompanied her parents on the voyage to Sydney, Australia aboard the Emerald Isle in 1841. When Margaret was in her mid-forties she married John Loudon on 5 February 1884. Matthew Emerald Robson, was born on 11 September 1841 in at sea, in the Bay of Biscay aboard the immigrant ship, Emerald Isle, and Matthew was named after his grandfather Matthew Robson, following English naming traditions, and also in honour of the ship they were travelling on. His birth was registered at Hoxham, Newcastle, New South Wales 1842. 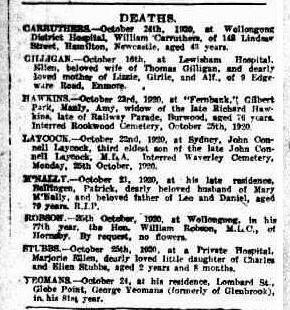 He died on 16 Mar 1899 at Wallsend Cottage, Mt Keira, Wollongong, NSW. He married Anne Elliott in 1859 in Wollongong, New South Wales and they had a large family. She was born in 1840 in Tyrone, Ireland and died on 31 December 1916 in Woollahra, New South Wales. William was born on 25 February 1843 in East Maitland, New South Wales, Australia. 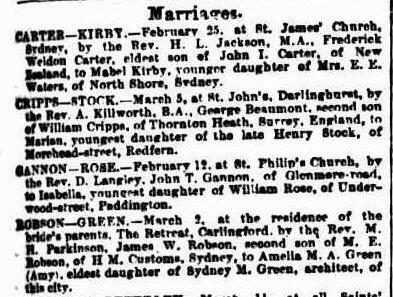 William married Annie Robertson Kippax on 17 March 1868 at The Wesleyan Church, Bourke Street, Sydney. She was the eldest daughter of William Henry Kippax and Elizabeth Whitton Robertson. They had three children, William Elliott Veitch, known as W.E.V. b 1869, Ethel Kippax b 1872 and Reginald Norman b 1878. Mary Robson, was born in 1846. 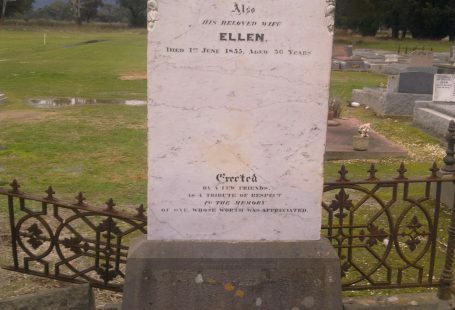 She died in 1848 in Black Creek, near Maitland, New South Wales, and is presumably buried with her mother Ann in a cemetery near this area. Thomas Robson, was born in 1848 in West Maitland, New South Wales, Australia. He died in 1937 in Wickham, New South Wales. He married Mary Ann Rossborough in 1868 in Wollongong. She was born in 1846 in Sydney, New South Wales. Jane Robson, was born in 1849 in the Hunter River District, Newcastle, New South Wales. 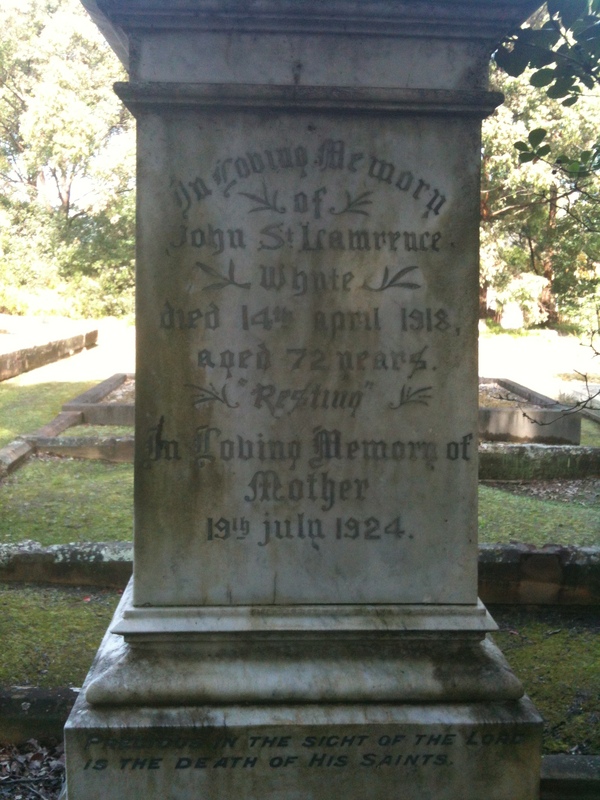 She died in 1851 in Black Creek, Maitland, New South Wales. Jane is probably buried with her sister Mary and mother Ann. Her mother Ann died on 16 January 1853 in Black Creek, near Maitland in New South Wales. 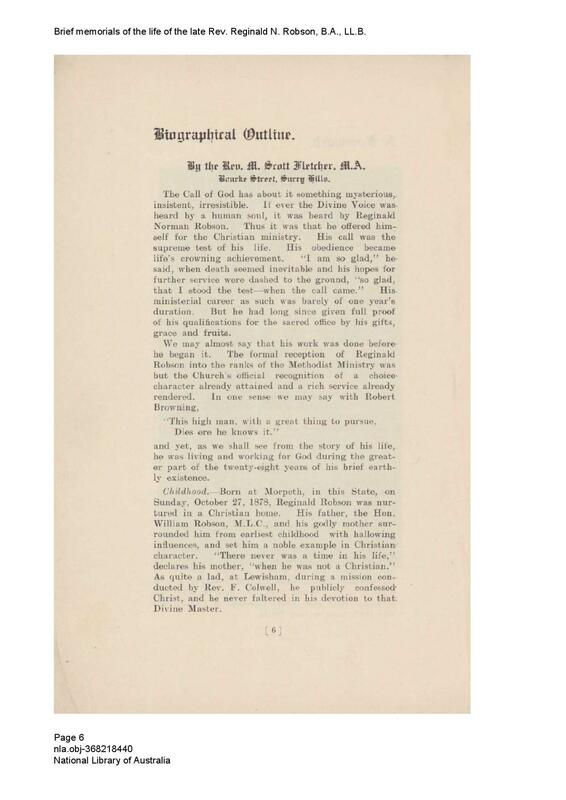 My research has concentrated upon searching early newspapers to document the Robson family, and expand on their contribution to the development of the Coal industry in New South Wales. William Robson Snr. was employed by the Australian Agricultural Company for work in Newcastle, N.S.W., his wife Ann and daughter Margaret were also given assisted migration to Australia from Northumberland, England, in 1841, later William moved the family to Wollongong and leased the Mount Keira mine. 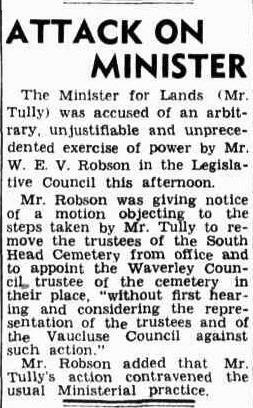 During my research, I uncovered a series of Reminiscences of the Illawarra and No 39 in particular accounted for a fascinating first-hand account of William Robson M.L.C. 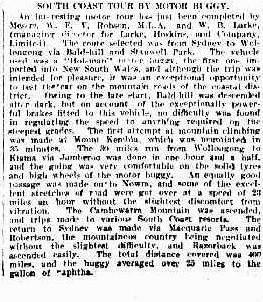 and his involvement in the coal mine at Mount Keira, Wollongong. 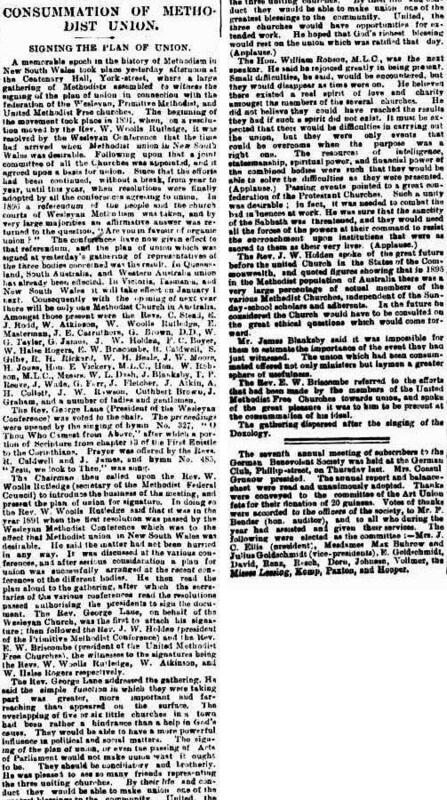 Many family members are included in this article including a cousin, George Robson, his son in law Michael Phillips, James Cram, William Wiseman and John Richardson. During my childhood, my father never mentioned his grandfather William Robson Jnr., and rarely his father W.E.V. Robson. 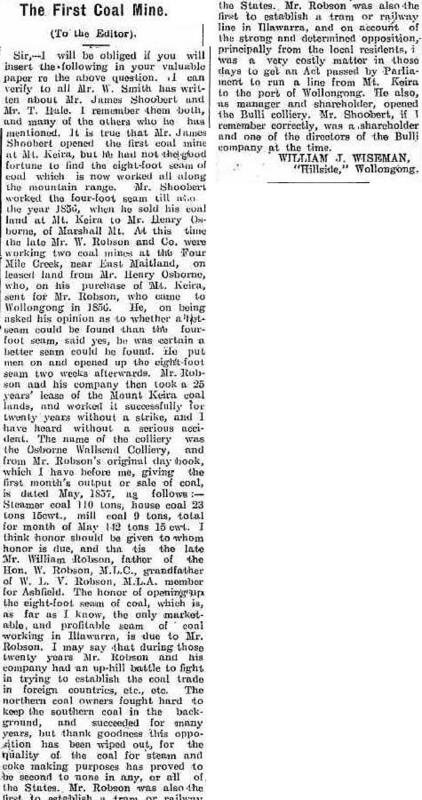 He was however extremely proud of the Robson family and their connection to both mining in Northumberland in England and the pioneering days of his great grandfather in the coal mining industry in New South Wales. Religion was not something that was mentioned or was important in my upbringing. During the 1960’s my sister Lavinia and I were taken to St Mark’s Church at Darling Point for Easter and Christmas Services by our father, Reg. Robson. Our mother Vena, did not attend church, she was always busy preparing the family lunch. Our brother Bill, was working in New Zealand for dad’s firm Henry Brooks (NZ) and Company. It was not until I began my family research that I realised that I came down a line from three William Robsons. 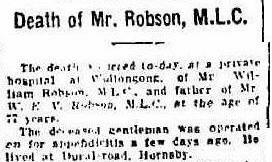 I also discovered that my elder brother was named William John Robson, in honour of his two grandfathers. 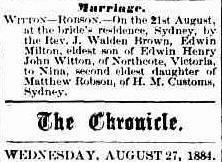 William Robson married Annie Robertson Kippax on 17 March 1868, at the still surviving Wesleyan Chapel at 348A Bourke Street, Sydney. 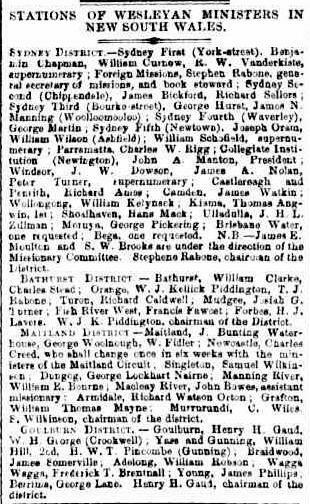 This record above shows that William Robson was allocated a position in the Wesleyan Ministry in Young, New South Wales shortly after his marriage to Annie Robertson Kippax and the birth of their first son William Elliott Veitch Robson, who was born in Sydney. 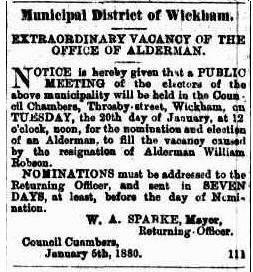 William was variously appointed to Wesleyan Ministries at Adelong, Young, Braidwood, Waratah and Morpeth. 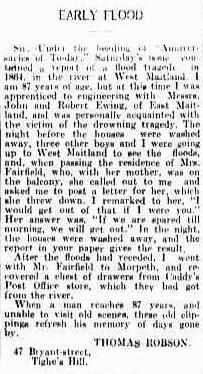 A daughter Ethel was born in Braidwood in 1872, and a son Reginald was born in 1878 in Morpeth. 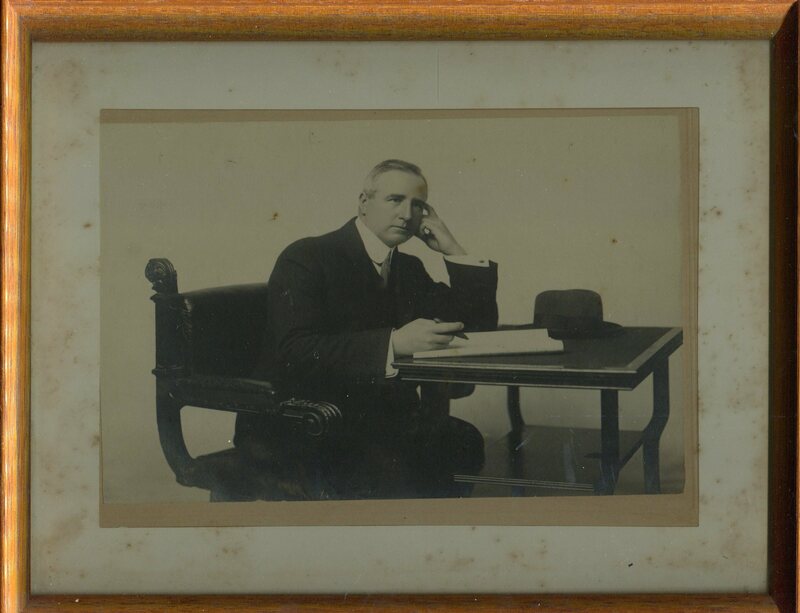 William had many and various interests, some stemming from his religious connections in the Methodist Church and others from his community involvement, which led to his resignation from the Methodist Ministry in 1900, and becoming a Member of the Legislative Council in 1900 until his death in 1920. 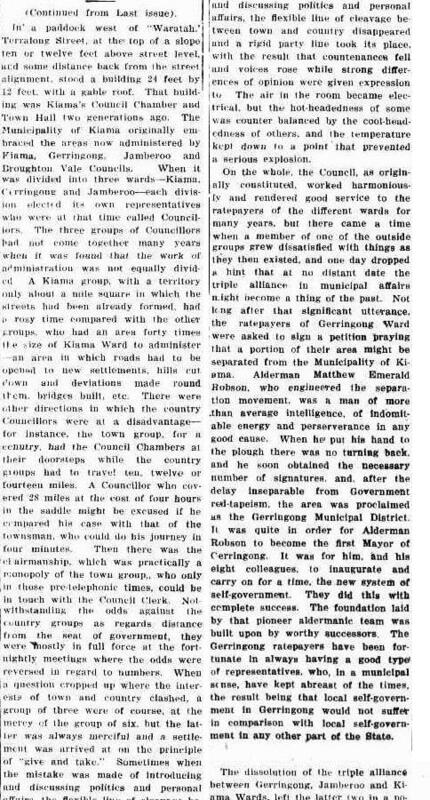 He was also an accountant and like his father, a Justice of the Peace, among many other positions. 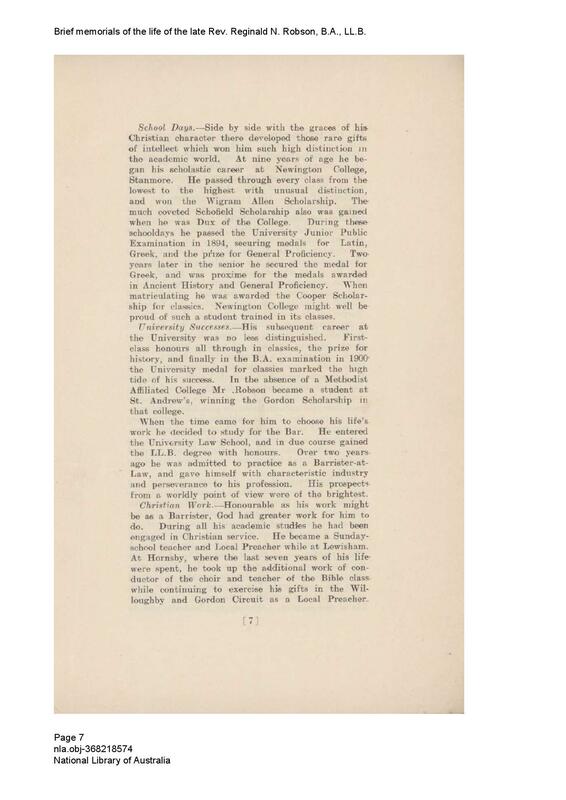 It is helpful to have so many accounts of his life through official papers, newspapers and books, and really the illustration of these articles in this chapter can go more to explain his life, than my writing as author of the family tree chapters. 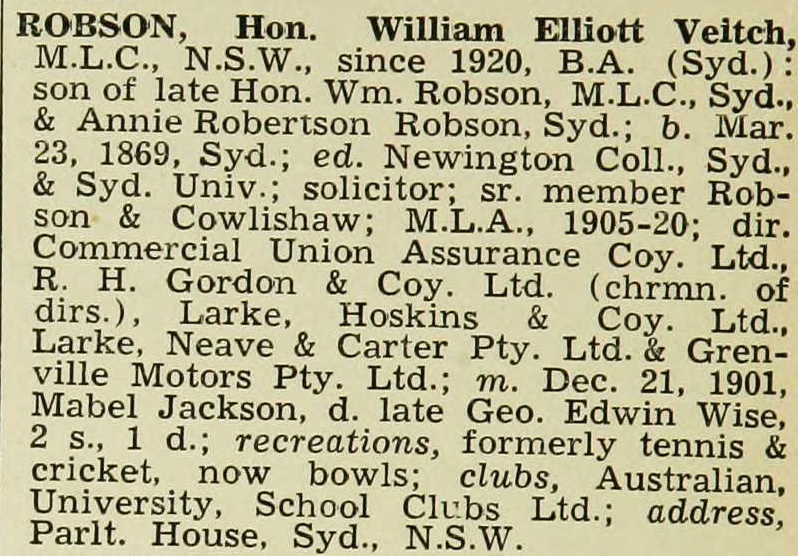 Biography from the Cyclopedia of New South Wales Parliament, accounting for many of Williams interests and commitments. 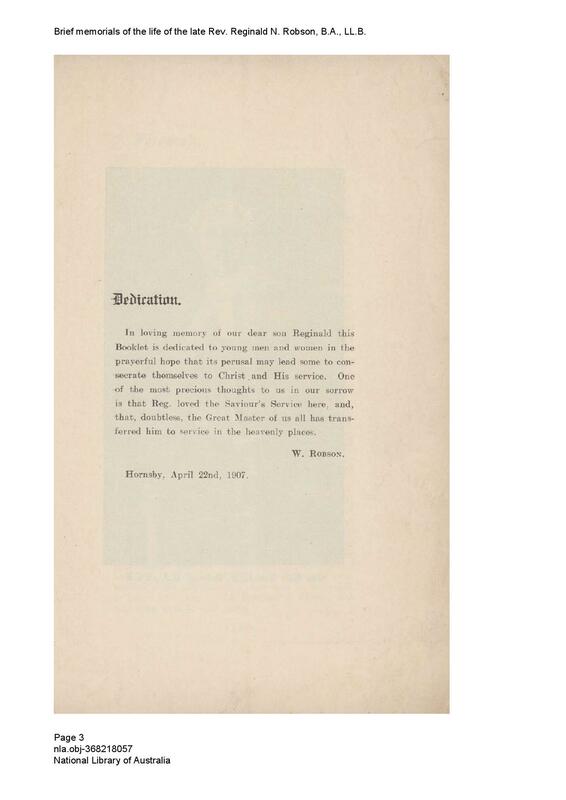 Dedication booklet given to William Robson Esq. 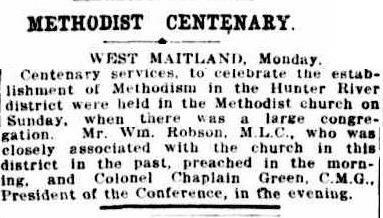 J.P. 26 February 1900 by the Lewisham Branch of the Wesleyan Methodist Church, in recognition of William service to the church. Rev. 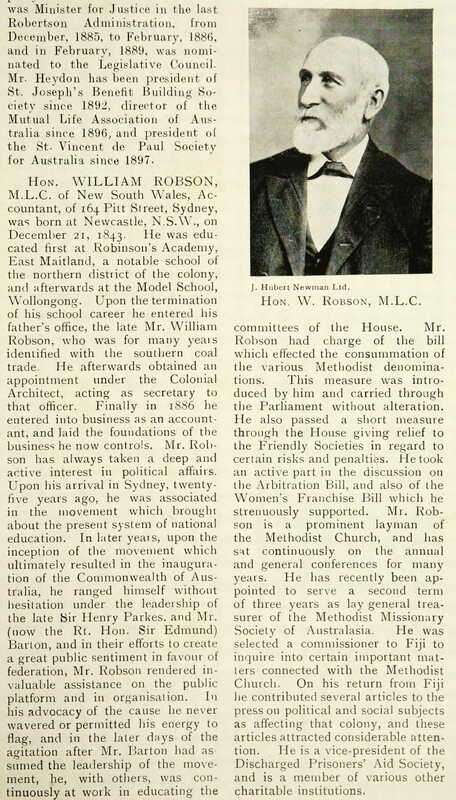 William Robson must have resigned his ministry from the Wesleyan Methodist Church when he took up his role in 1900 as a Member of the Legislative Council of New South Wales. He must have felt that his contribution to his community extended beyond the church and into shaping the future of New South Wales. I found this Booklet amongst my father’s papers and books after the sale of our home in Point Piper in 1997. It wasn’t until I started doing the family research that I realised the significance of this gift to William. 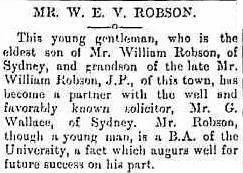 William and Annie Robson had much to be proud of, their eldest son William Robson, known as W.E.V. 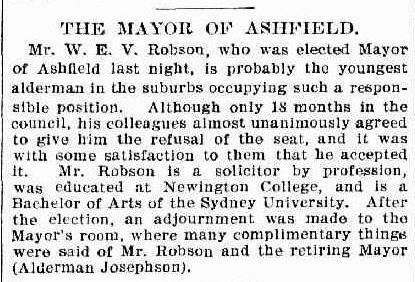 Robson had been elected to the seat of Ashfield in the New South Wales Parliament in 1905, after he had served a period of time on Ashfield Municipal Council, as Alderman and Mayor. W.E.V. had firstly married Ettie Gorman Cusack Whyte, on 17 October 1994, however tragically, Ettie died of congestive heart failure in 1899. They had no children. W.E.V. 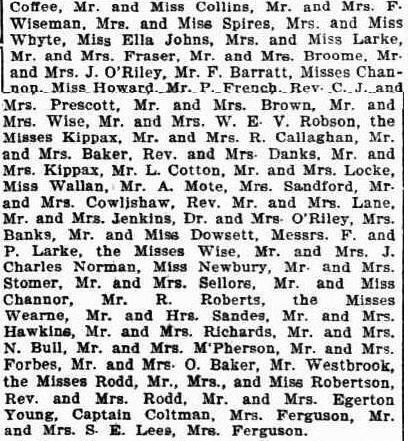 later married my grandmother Mabel Wise on 21 December 1901. 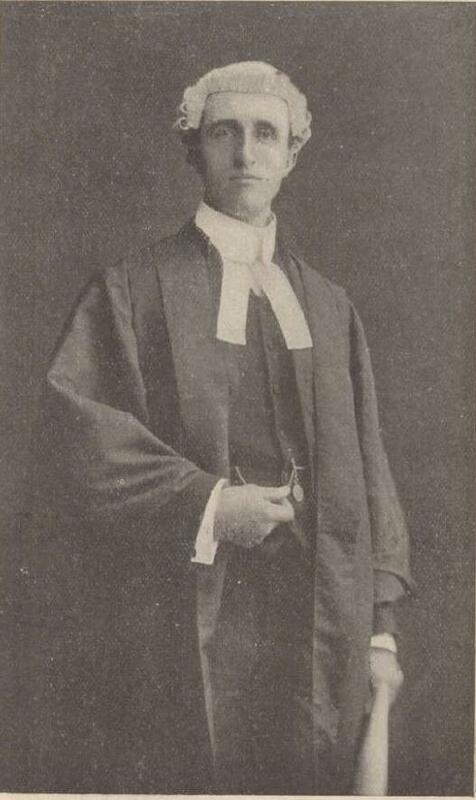 The Robson’s youngest son Reginald Norman Robson was proving himself to be a scholar of ancient Greek and Latin and excelled at both Newington School and later at the University of Sydney where he undertook an Arts degree and later a Law degree. 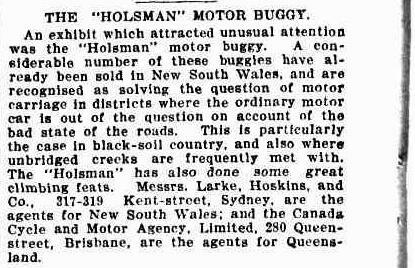 Their daughter Ethel Kippax Robson, in 7 May 1904, had married an engineer named Charles “William” Bain Larke, a Canadian born inventor, who was instrumental in founding the early car industry of Australia, developing a business called Larke Hoskins. 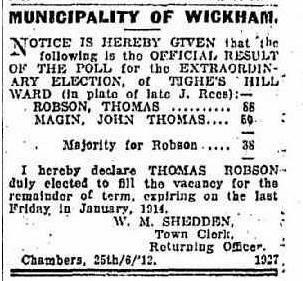 W.E.V Robson later sat on the Board of Larke Hoskins for 44 years from 1907. I will expand on the children of William and Annie Robson later in this chapter. 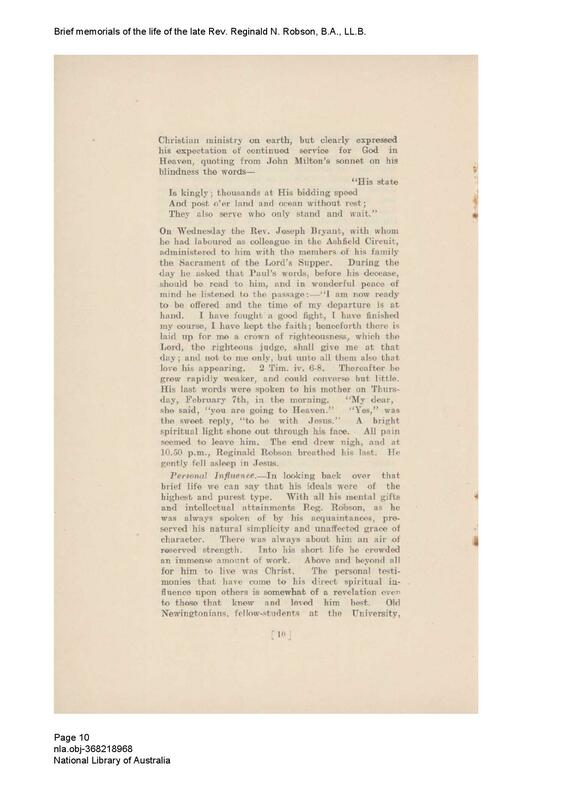 The Robson Family must have been very proud to read this letter, written by William J Wiseman, a step-brother to William Robson M.L.C., about his father’s mining exploits. Commemorative sterling silver and bone handled Trowell, presented to Hon. W. Robson M.L.C. 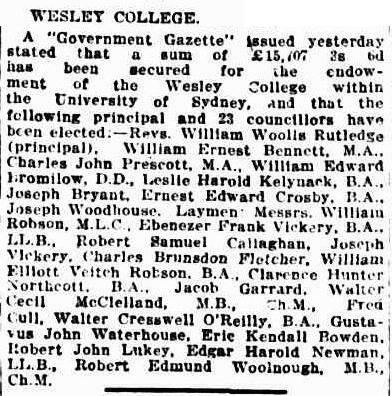 benefactor of the college, on the occasion of laying a memorial stone of Wesley College, University of Sydney Dec 2nd 1916. The Robson family of Point Piper have traditionally used this for cutting the Pavlova for family gatherings. I am lucky to be the custodian of this family heirloom, and will pass it down the generations knowing it will be treasured and remembered. It was interesting to see that my grandfather W.E.W. 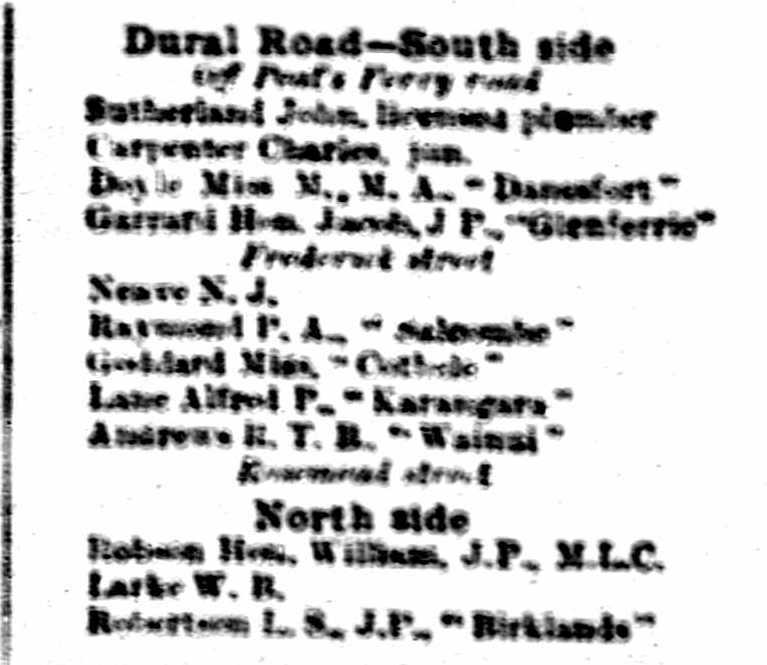 Robson’s address was given in this notice as Darling Point. I had often heard my dad mention that he lived for a short time in Darling Point Road before the family settled in Drayton, Rose Bay. Records at Ascham School, Edgecliff, where my sister and I went during the 1960’s and 70’s were turned up recently by the Ascham School Archivist, to show that dad had attended Ascham Kindergarten for a few years around 1920. This interesting news came after my sister went to a morning tea reunion at Ascham, and in the new year she will try and obtain the records. Rookwood Cemetery, New South Wales, husband and wife dying in the same year, 1920. 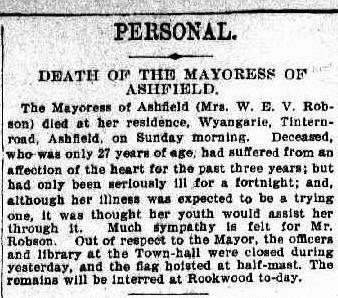 It was tragic to learn about the death of William and Annie’s youngest son at the age of just twenty-eight at Hornsby on 8 February 1907. A gifted scholar of ancient languages and law. The death of such a promising young man must have been so heartbreaking for his parents, William and Annie, and siblings, Ethel and W.E.V. Robson to have accepted this tragedy. I then found that William Robson M..L.C. 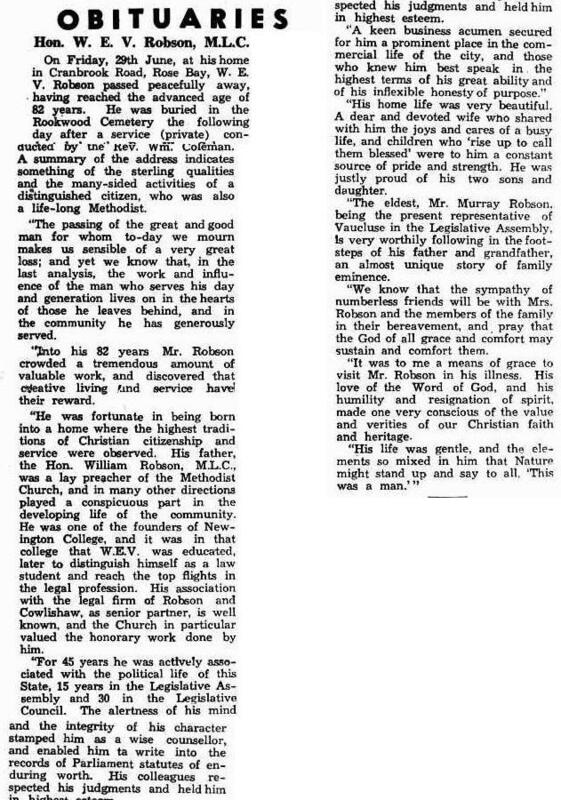 wrote a Memorial to the life of Reginald Norman Robson as a tribute to the life of his son, listing his achievements, devotion to his church, his friends and family and for the brave way that he accepted his illness and put up with terrible pain up until the end of his life, never complaining nor blaming, and with fortitude he accepted his early death. The next few illustrations come from William Robson’s book on his son, which is lodged with the New South Wales State Library. Also included is a book review from the Australian Christian Commonwealth Newsletter. 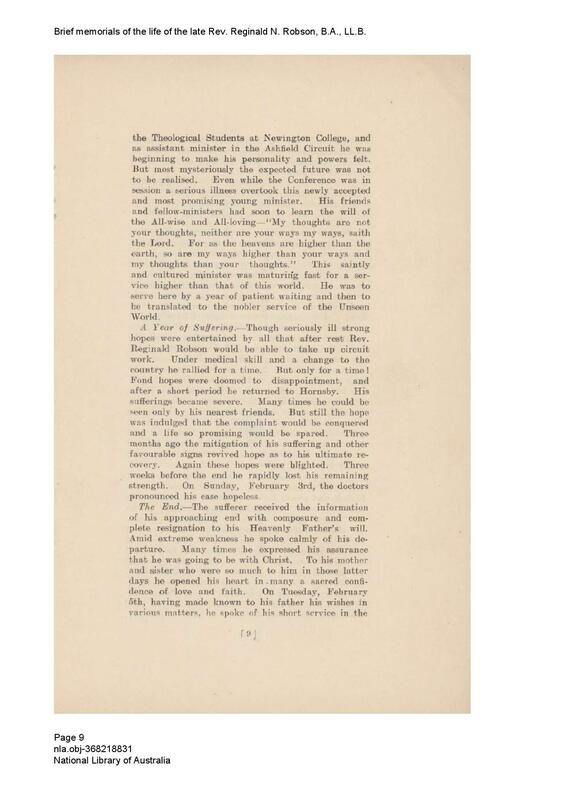 At the end of the memorial book is a summary of the sermon which was delivered at Reginald’s graveside. I can send this to anyone interested in requesting a copy. In 2013 Lavinia and I met Terry Larke at Rookwood Cemetery, his grandmother was Ethel Robson, a sister to our grandfather W.E.V. Robson. Terry had been there years earlier, and Lavinia and I had spent several days in the last few years traipsing around Rookwood discovering the many family graves we had never even heard about or knew existed. Terry joined us on one of these expeditions, and afterward at a café we exchanged a few documents. 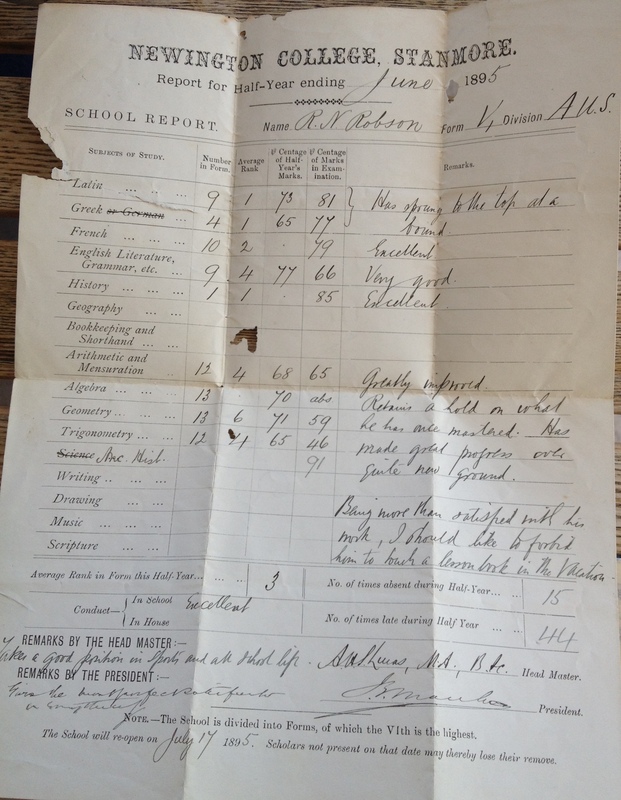 Terry Larke kindly shared this precious Newington School report he had of Reginald Norman Robson’s and it is a delight to see what a talented student Reginald was. Rev. 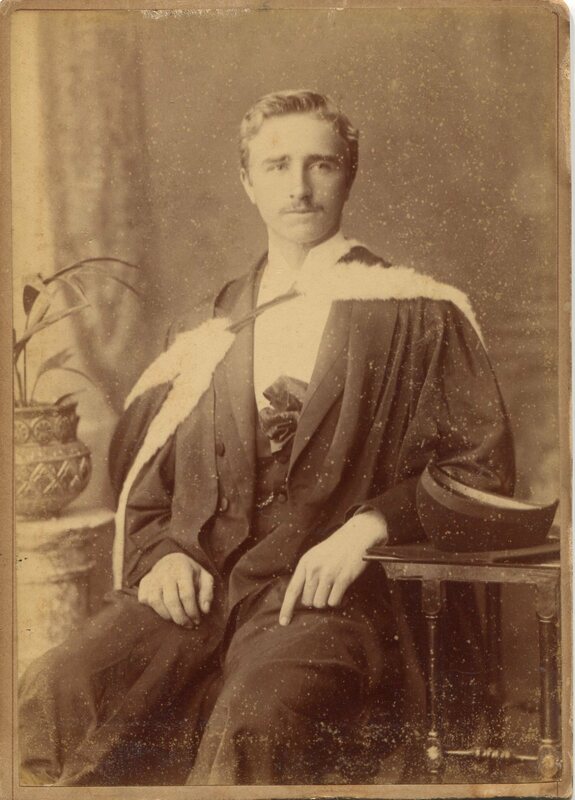 Reginald Norman wearing his academic Bachelor of Arts Gown with Mortar Board upside down on side table. 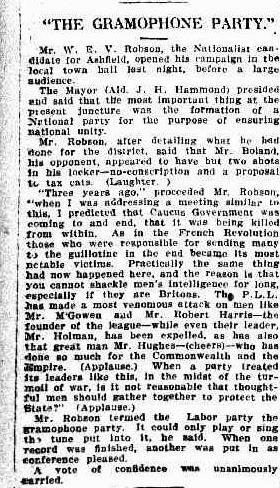 It was with a heavy heart that I decided to order a transcription of Reginald Norman Robson’s death certificate and it was heartbreaking to read that he died of tuberculosis with the understanding that his terminal ailment would have been shockingly painful. We don’t realise how lucky we are to live in a time of antibiotics to cure these terrible diseases. Photograph kindly supplied by Ann Loveridge my first cousin, only daughter of Kathleen Robson and John Wigmore Heath Drury. Ann very kindly visited my home and showed me some lovely family photographs she had in her collection, and very kindly allowed me to copy them for the Robson Family History. This photo of Four Generations of the Robson Family sat on the wall of my father’s dressing room at 64 Wunulla Road for as long as I could remember. Dad was very proud of this very old photo and it was fascinating for me to gaze at the photo knowing these were my ancestors. The only person I knew in the photo was my grandmother, Mabel Robson nee Wise, seated LHS. It shows my great great grandparents, William and Elizabeth Kippax and great grandparents William and Annie Robson. All three of William and Annie’s children, W.E.V, Ethel and Reginald are standing and W.E.V. and Mabel’s first born son Alan is seated on William Kippax’s knee. It is such a precious photo, and I am so lucky to have this photo now in my collection. All the ladies are wearing a bouffant hair style and have long dresses on, my grandmother appears very stylish. 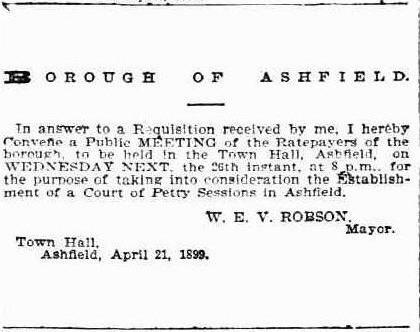 It didn’t take me long to find some information about Ethel Kippax Robson’s marriage on 7 May 1904, after I realised that the date on this photo was wrong. 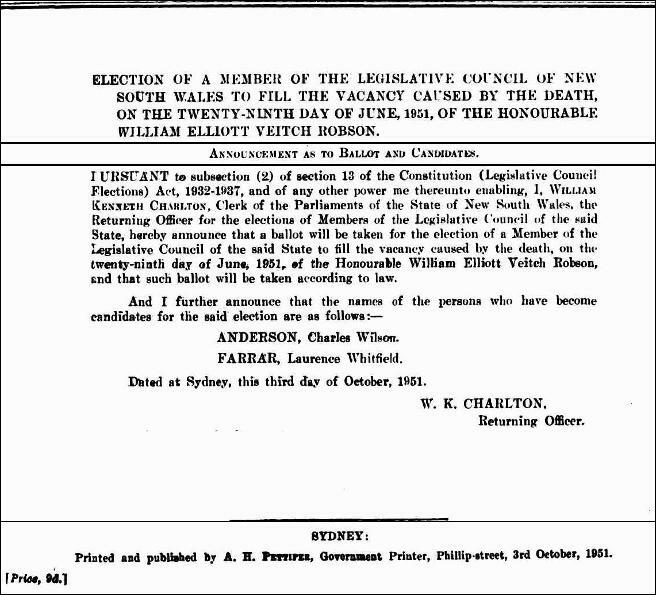 After William Robson became a Member of the Legislative Assembly for New South Wales William and Annie Robson settled at Dural Road, Hornsby. 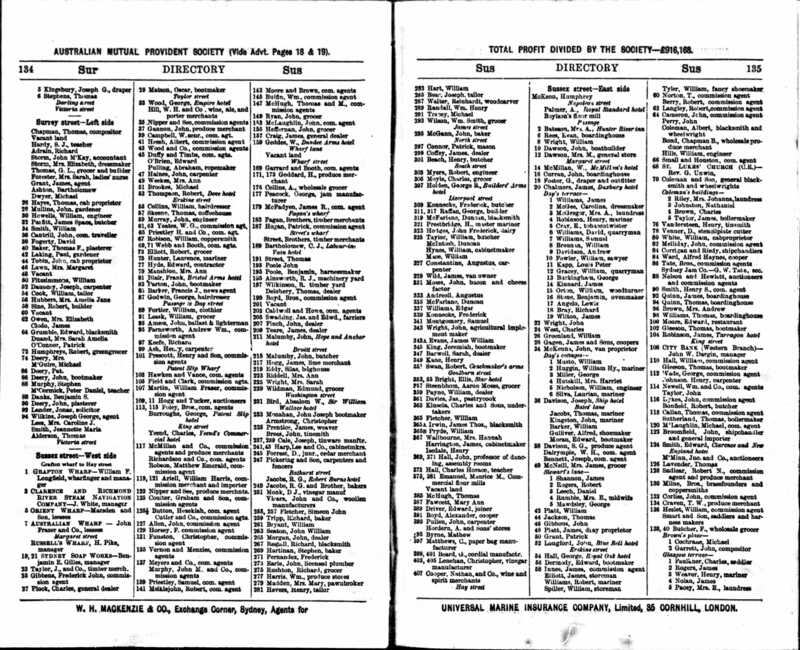 It was delightful to pick up this directory and find that in 1910 William and Annie Robson and William and Ethel Larke were next door neighbours, and not only that, but opposite, was Norton and Elsie Neave. Elsie and Annie were sisters, both daughters of William and Elizabeth Kippax. 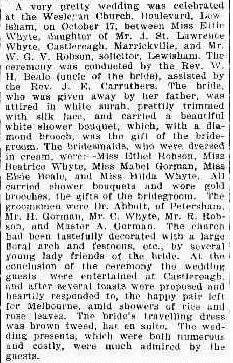 This image is very faded, I however found another mention of Ethel’s Wedding in the Evening News, although it was not as detailed, I have illustrated it on the next page. 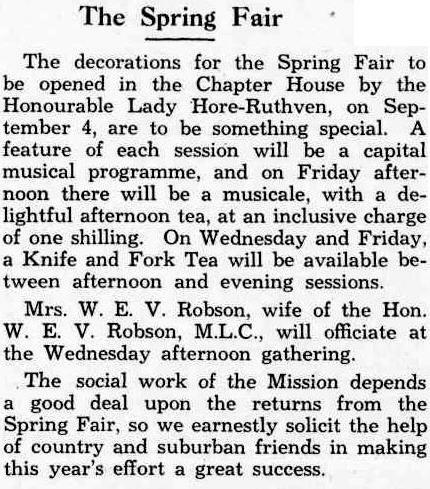 Ethel Larke nee Robson, Mabel Robson nee Wise, Betty Larke, William and Ethel Larke’s daughter, and the Neaves, all attended the large gathering that evening. Peter Drury is the son of John Drury and Kathleen Robson. Kathleen was the daughter of W.E.V. Robson and sister to my father Reginald George Robson. Peter has attempted to identify the board members. 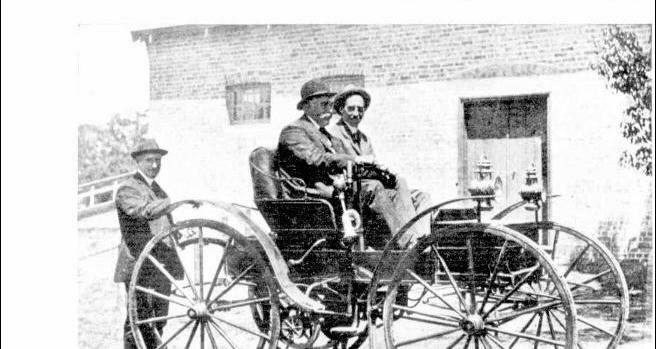 From left to right, Claydon Neave, Reg Carter, ?, William Bain Larke, W.E.V. Robson, Norton Neave and Percy Larke. The Larke Hoskins board was very much a family affair, with two brothers William and Percy Larke, William Larke’s brother in law W.E.V. Robson and two of the Neaves, father and son. 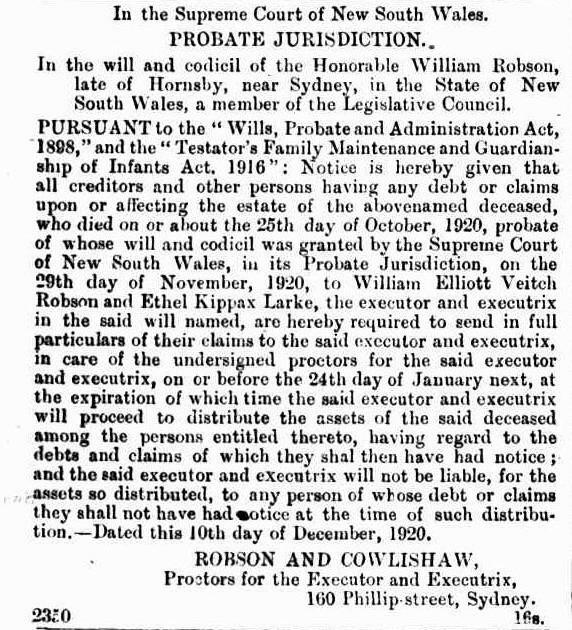 Norton and Clayton Neave were very much part of the extended Robson/Kippax family. Elsie May Kippax, the youngest daughter of William Henry and Eliza Robertson Kippax married Norton Neave on 14 May 1904 and their only son Reginald Claydon Neave was born in 1907. This photo would make him about 27 years of age at the time of the photo. 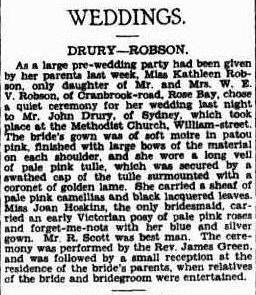 It is interesting to note that Elsie Kippax was sister of Annie Robertson Kippax who married William Robson M.L.C. However, Elsie was the youngest, born in 1874, and Annie was the eldest daughter born in 1850. It is a fact that when Elsie was born to William and Elizabeth Kippax, their eldest daughter Annie Robertson Kippax was already married to William Robson M.L.C. and had already given birth to their first son W.E.V. Robson in 1869 and their only daughter Ethel being born in 1872. It turns out that aunt and cousins were very much contemporaries, Elsie Kippax and Ethel and W.E.V Robson would have grown up together, and it is not surprising that Elsie’s husband Norton Neave became a close friend of both Ethel Larke nee Robson and her brother W.E.V. Robson. It was quite a challenge to fit all the family together in the family tree, especially having come from a position of not really knowing much about the extended Robson family. I had to study hard to paint a picture of this large family and their inter-relationships. 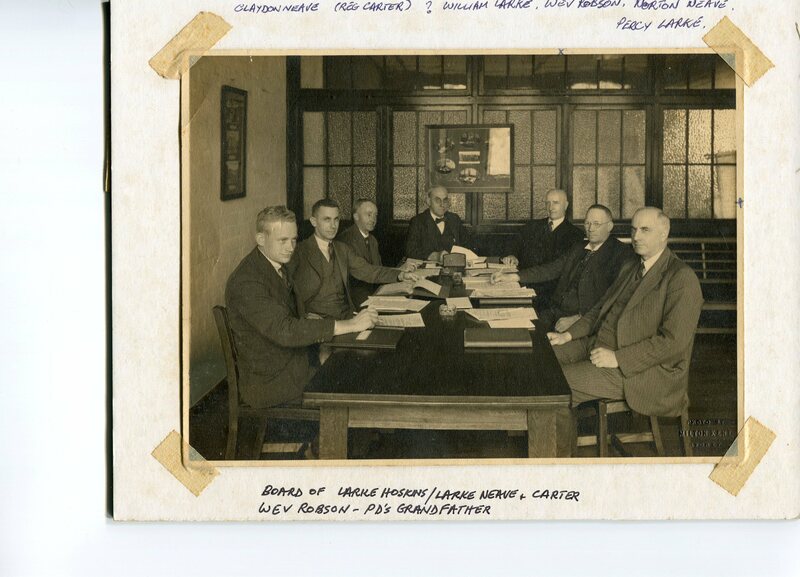 The photo of the Larke Hoskins board members greatly helped me to gain an incite into the Robson/Larke/Neave extended family and their great friendships that then merged into the Larke Hoskins business and their Board of Directors. The Hoskins side of the family should not be forgotten either, because Mabel Robson nee Wise’s sister Lily Wise married to Richard Hoskins Jnr. 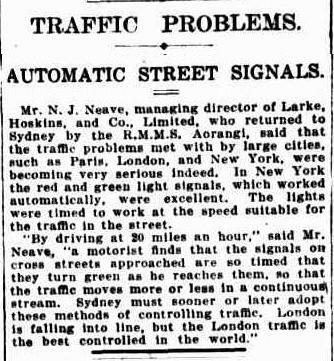 an Englishman on 11 November 1905 who was the partner of William Bain Larke. 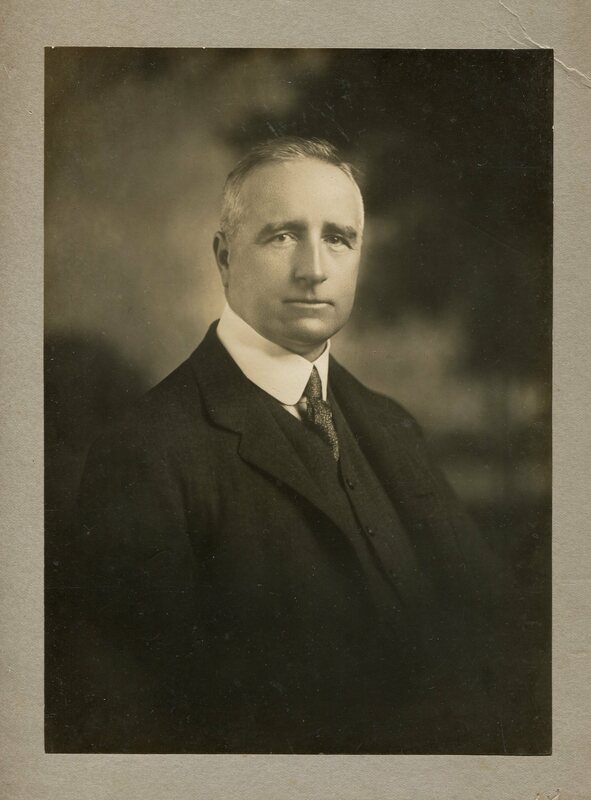 Mabel and Lily’s father George Edwin Wise, founder of the Western Stores was also a member of the Larke Hoskins Board until his death in 1933. In separate chapters I deal with these extended families. 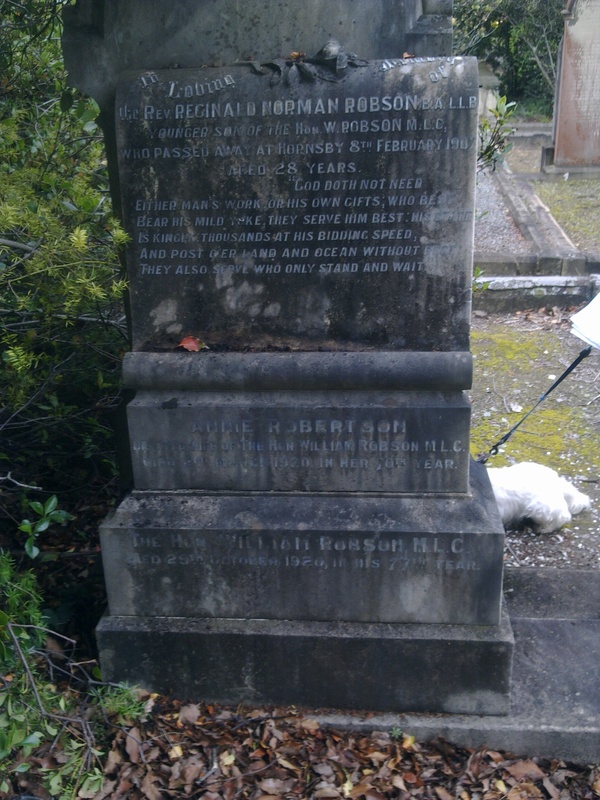 I have already written a chapter about William Robson Snr of Northumberland, England and Newcastle and Wollongong, New South Wales, another about The Kippax and Howell Family, to add to these chapters my last in this Robson series will be The Robertson Family, in which I am excited to have made links that enable me to take this family back to Dundee in Scotland. 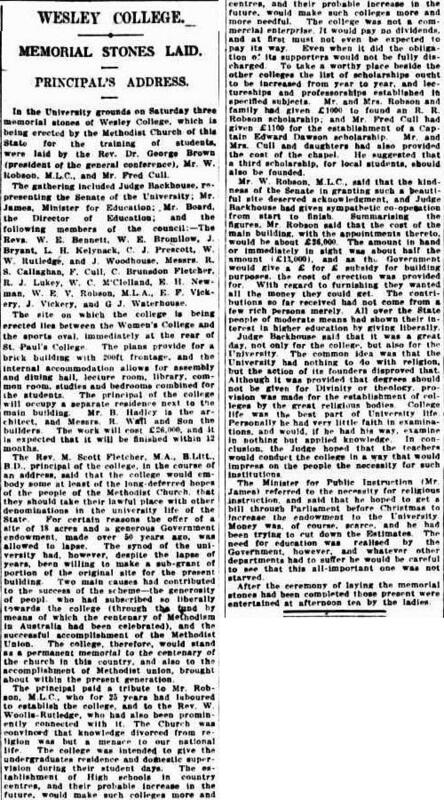 Trove Digitised Newspapers is a wonderful research tool which is a search engine of online Australian Newspapers run by the National Library of Australia. More and more regional newspapers are coming online and since I started my research in 2011 it is surprising to revisit the site and find more information becoming available. 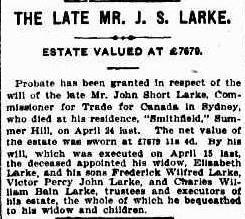 Estate matters such as John Short Larke’s probated will give so much valuable information about families. This Rookwood Cemetery headstone of the Larke family also gives a huge amount of information about them, and an interesting fact is that it lies adjacent to William and Eliza Kippax’s grave in the Methodist New Section of the cemetery and about 10 metres from W.E.V Robson, his wife Mabel and their eldest son Alan Robson. I found this grave quite by accident as I was looking for the Kippax grave, and knew immediately that there was a family connection. However, it was not until I returned home and studied the photos that I was able to work out the connection to William Bain Larke and his wife Ethel Robson. 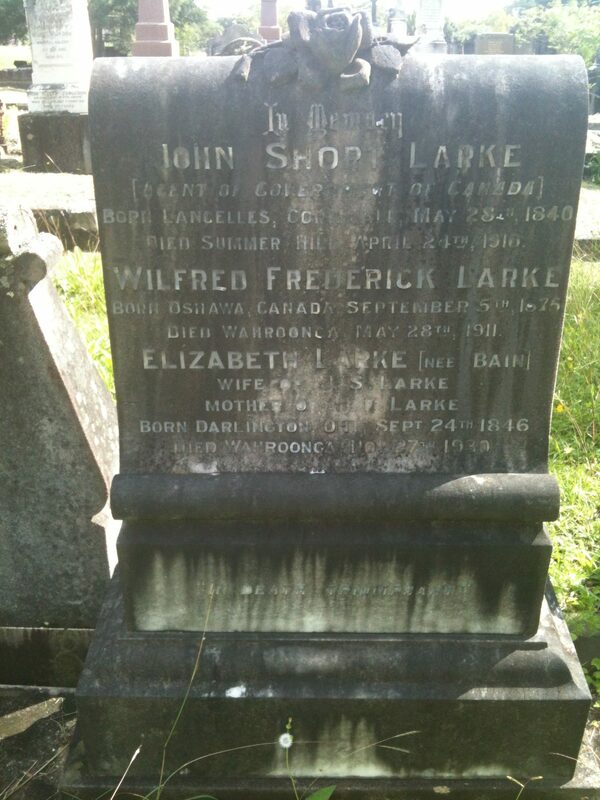 The headstone lists William Bain Larke’s parents John Short Larke, Trade Commissioner for Canada, who was born in Lancelles, Cornwall 28 May 1840 – 24 April 1910 and his wife Elizabeth Bain, who was born in Darlington, Ontario on 24 September 1846 – 27 November 1930. It is clear his mother passed on to him her maiden name. Also, buried in this grave is William’s brother Wilfred Frederick Larke who was born in Oshawa, Canada, 5 September 1875 and died on 28 May 1911 at Wahroonga. William Elliott Veitch Robson “W.E.V.”, was the eldest son of William Robson M.L.C. and his wife Annie Robertson Kippax. W.E.V. 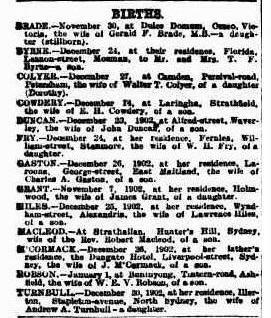 married Ettie Cusack Gorman Whyte on 17 October 1894 at the Wesleya Church, Lewisham, New South Wales. 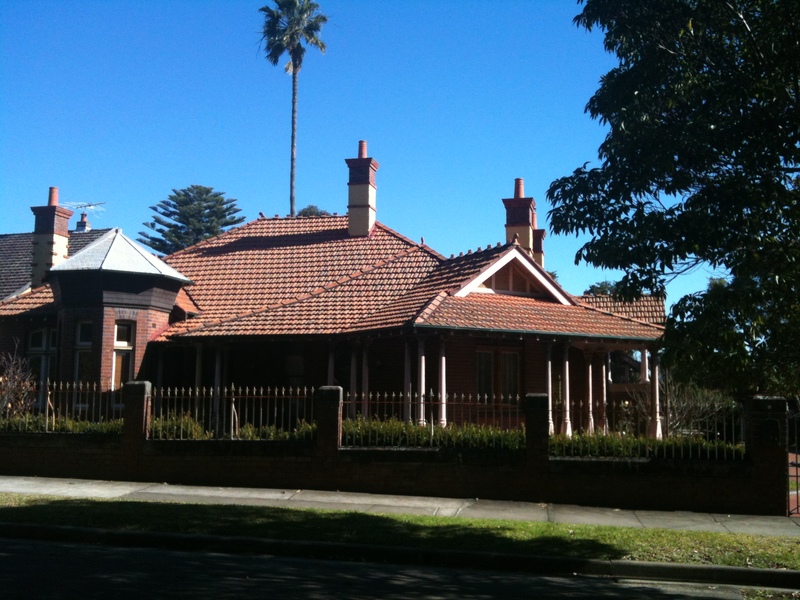 William and Ettie lived at Wyangarie, 29 Tintern Road, Ashfield until Ettie’s death at their home on 30 April 1899. 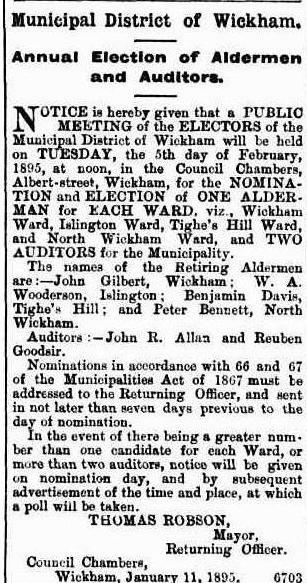 William was elected under the Free Trade Party in 1898 onto Ashfield Council, and he served as an Alderman for ten years, becoming Mayor of Ashfield in 1900. My earliest research in 2011 when I first joined ancestry.com was on the Robson and Kippax lines in my family tree. 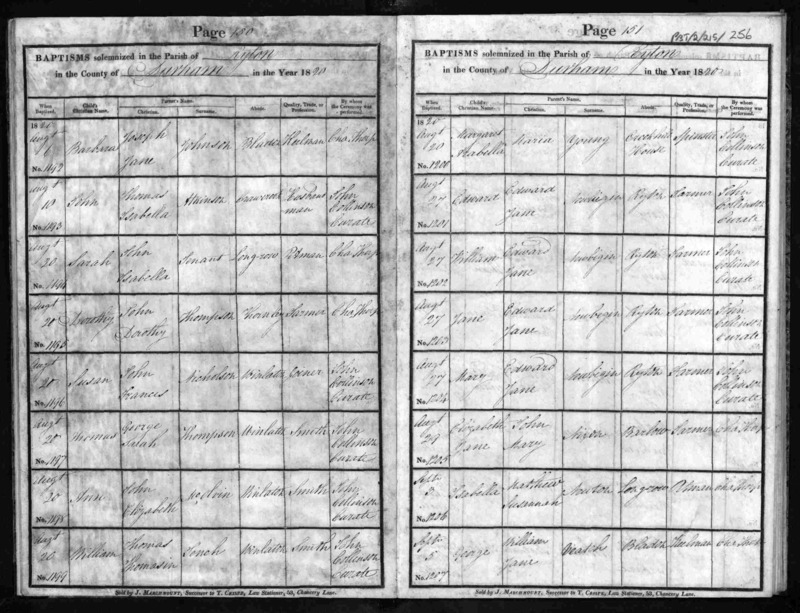 I had no trouble finding my grandfather W.E.V Robson’s birth record and establishing his parent’s names from this record as William and Ann R.
However, it came as a complete surprise when I found his marriage record listing Ettie as his wife. I can clearly remember visiting my mother that same day and sitting down for afternoon tea, our great family tradition, I broached the subject of my father’s father. Mum quickly confirmed that W.E.V. Robson had indeed been married before his marriage to Mabel Wise. I wondered why I had never been told? It was sad to think that they were only married for a short time and I wondered how she had died. The ancestry.com records are only partial and I decided to purchase Ettie’s death certificate. It is sad that these are only available as transcriptions because my research has trained me to only be satisfied with original documents. It was tragic to read about Ettie’s two-week illness which ended her life and presumably it was some sort of dreadful influenza that took so many young lives. Noting that she was buried at Rookwood Cemetery, and the fact that so many of our family are buried there, I enlisted my sister, Lavinia’s help and we embarked on a spring time visit to the cemetery. It was amazing to visit this beautiful place. Rookwood Cemetery is an entire suburb of Sydney and it is the largest cemetery in the Southern Hemisphere. Visiting in Spring is amazing, the roses, jasmines, and watsonia were blooming magnificently in this quiet and peaceful place. A visit to the general office soon gave us directions to the Methodist Old Cemetery in the same row where William and Annie Robertson are buried. 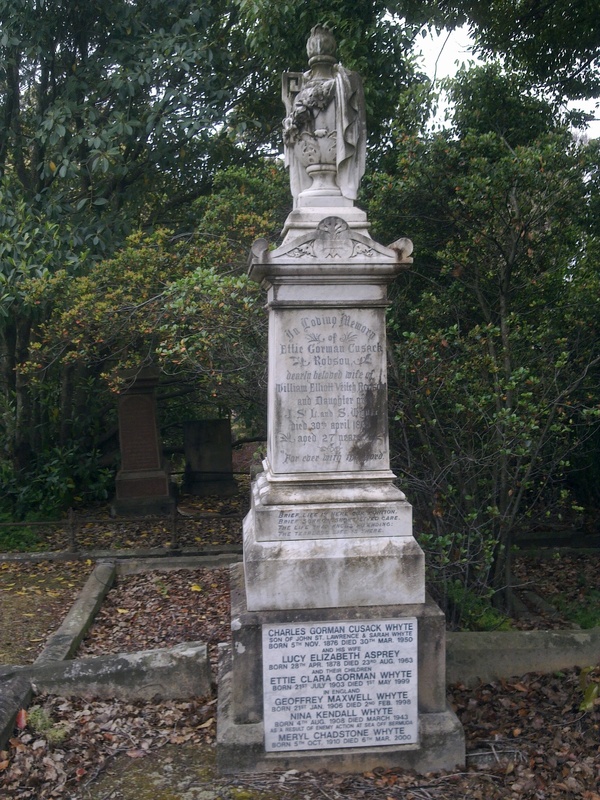 Monument grave of Ettie Gorman Cusack Robson and members of the Whyte family, Rookwood Cemetery, New South Wales. This area was very overgrown and the graves were obscured and it was difficult to reach the spot where Ettie lay. Nothing could prepare me for the loveliness and the romantic nature of this beautiful monument of pure white marble. It was a moment of sheer astonishment for both my sister Lavinia Chrystal and myself to behold this hidden grave, and tears welled in my eyes and I understood how sad W.E.V. 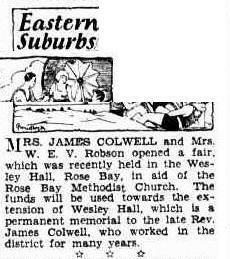 Robson, my grandfather must have felt at losing his beloved wife at such a young age. Ettie’s parents are also included on her grave monument, right hand side panel. William sold Wyangarie after Ettie’s death, I am sure he would have found it difficult to have lived in this home without her. Instead he purchased the vacant block next door and built a new home, and in a few years, he was to remarry and have four children, Alan, Kathleen, Ewan Murray and my father, Reginald George. William named his new home, Buninyong, and a visit to Tintern Road, Ashfield finds this lovely home still standing today. It is now classified by the National Trust and is acclaimed as a representative piece of architecture of the Queen Anne style. Sadly, Wyangarie was pulled down in the 1980’s after a campaign to try and save it from the demolition ball. Buninyong is a red brick multi fronted home which feature wooden and intricate fret work, wooden columns, terracotta roof and chimney pots, shingles and stained glass windows, tiles and terrazzo steps. The magnificent wrap around verandah must have endeared this lovely single story dwelling to local historians and lovers of heritage architecture. It also has a large back garden with several established trees and a gravel side driveway and entry porch. When we were there it was in the middle of an extensive renovation and some of the paint work was unfinished. 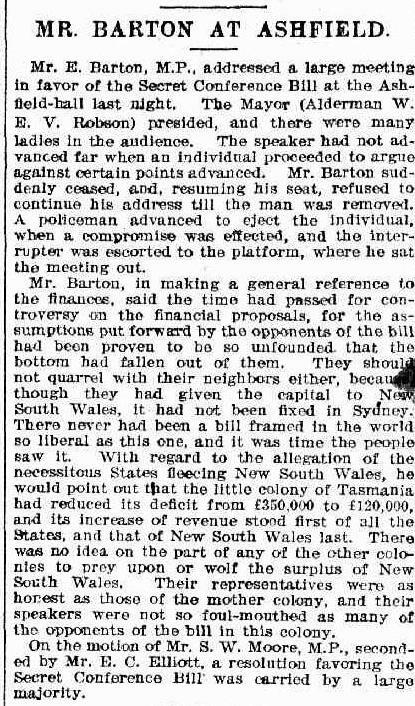 It was interesting reading to discover that amalgamations of Councils was a much discussed issue in Sydney or “Greater Sydney”. 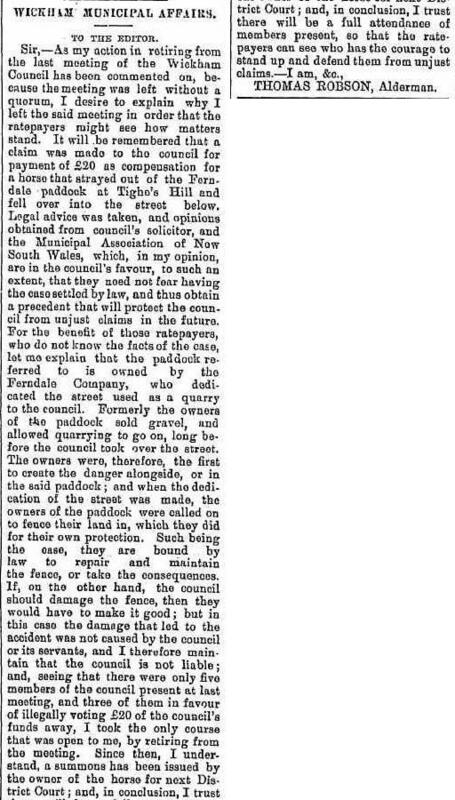 Nothing is apparently new, and Geoff and I with our own Local Government Party Residents First Woollahra have just been fighting this very issue that threatened the amalgamation of Woollahra with Waverley and Randwick in 2017. 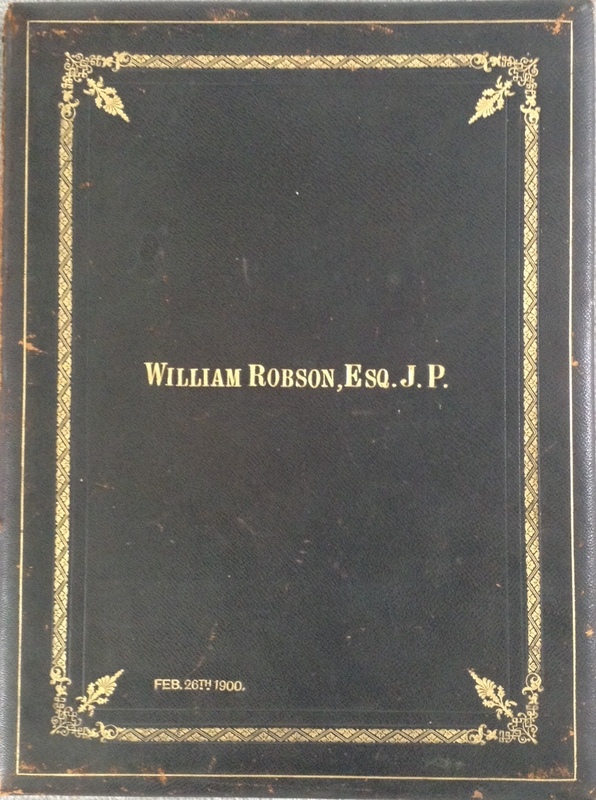 “ROBSON, William Elliott Veitch – Solicitor. B. 23 Mar 1869 Syd. s. of William (q.v. ); m. 21 Dec 1901 Mabel Jackson, d. of George E. Wise; 3s.1d. D 29 June 1951 Rose Bay. Ed. Newington Coll. and Univ. 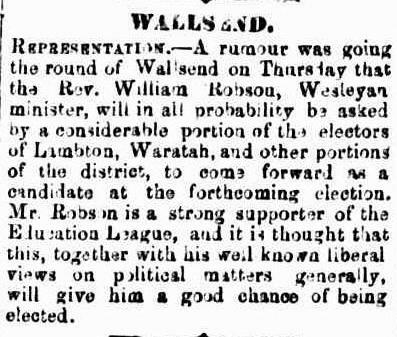 of Syd., BA 1899; articles G. Wallace 1889, admitted solicitor 1892; became snr partner in Robson and Cowlishaw; chmn of dirs. 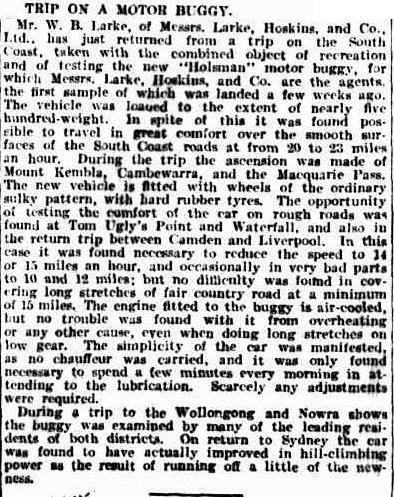 R.H. Gordon and Co. Ltd; dir Commercial Union Assurance Co. Let, Larke, Hoskins and Co. Ltd, Larke, Neave and Carter Pty Ltd and Grenvilled Motors Pty Ltd; dir Benevolent Soc. 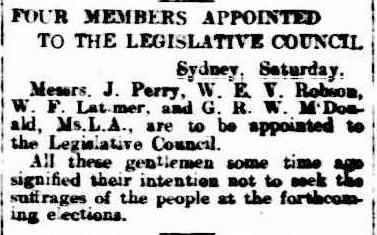 of NSW 1924-27; Councillor Newington Coll. ; member of Aust. Protestant Defence Assn; Aust. Club; Meth. 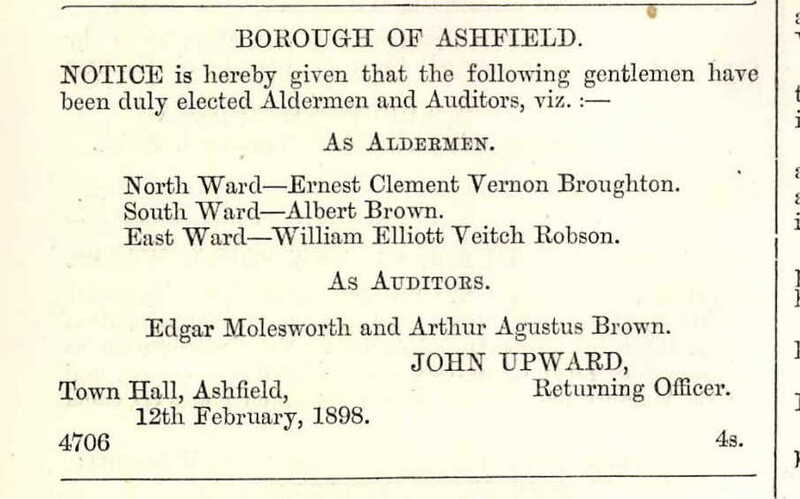 Alderman Ashfield 1898-1908, Mayor 1899. W.E.V. and Mabel were married in the Church of St James, Croydon on 21 December, 1901 and witnessed by George Edwin Wise, the bride’s father and Reginald Norman Robson, W.E.V. Robson’s younger brother. 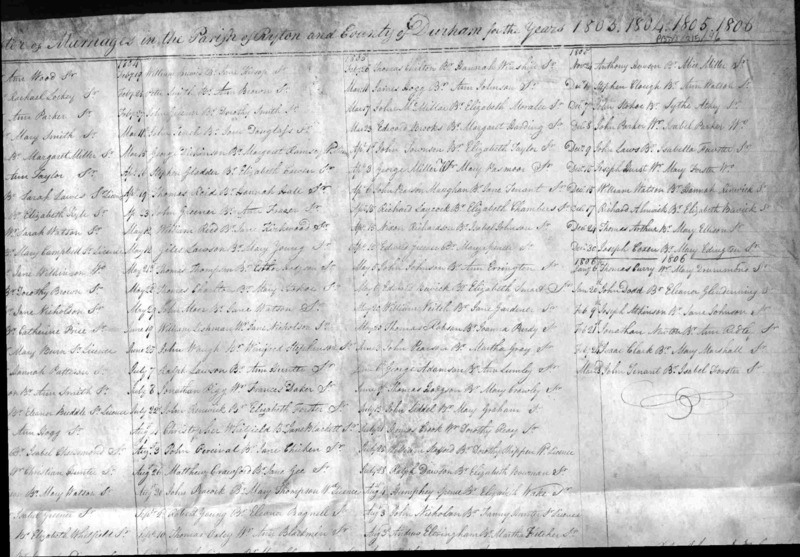 Both sets of parent’s full names are listed on the record, William Robson’s occupation is accountant and George Wise writes merchant. I found this record only recently when it was uploaded to ancestry.com. It was wonderful to see this original record and I hope that more of these precious documents are purchased. It is not clear how Mabel and W.E.V. Robson met because their worlds would have moved in vastly different areas within the bounds of the Methodist and Anglican Churches. It is probable that it was a social affair rather than a church or family affair that caused their relationship. Mabel’s father George Edwin Wise was born in Cork, Ireland and the Wise family migrated whilst he was a small baby to Australia and settled in country Victoria in the tiny gold mining town of Avoca. Theirs was a large family of five sons (George, Henry, Michael, William and James and a daughter, Ellen Alice. George’s father William McOboy Wise was originally employed as a farm manager until his property was overtaken by hordes of gold diggers. 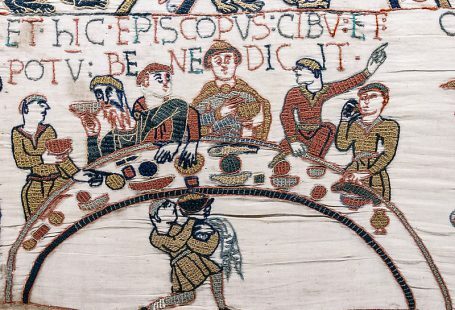 In the ensuing melee, he firstly charged rent to each digger on his property, netting a handsome profit and rightly so as they had pretty well destroyed every tree and shrub on his property in pursuit of anything gold and glittery. Later he was to open the Wise Kilpatrick General Store in Avoca selling anything and everything to the gold diggers. 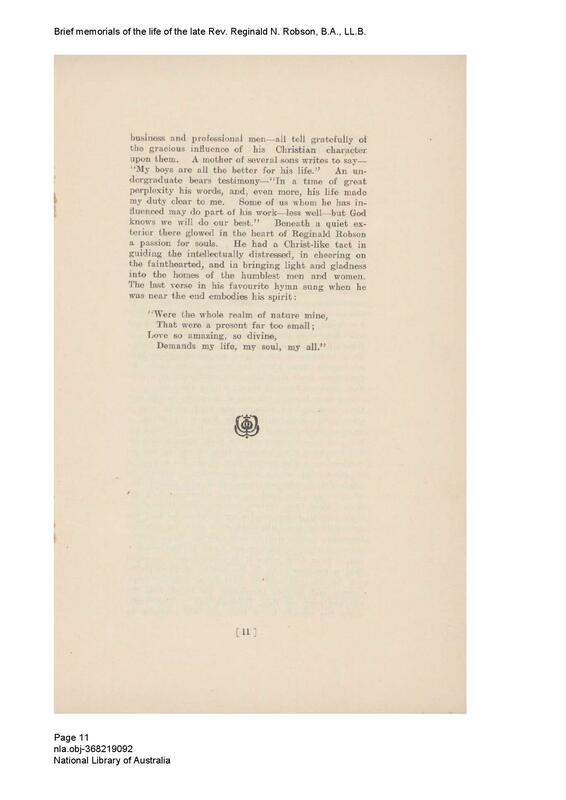 He was variously, shopkeeper, gold assayer, butcher, postmaster, auctioneer, master of the hounds, Steward of the Avoca Racecourse and generally the most popular person in town. 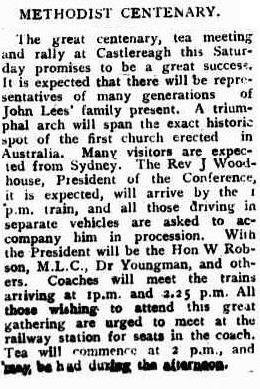 One thousand people turned up to William’s funeral, people coming as far as from Melbourne for the sad occasion. When his son George Wise left Avoca, he pursued the only trade he knew, the grocery business. George was a spectacularly successful business man and amassed a fortune in a few decades. 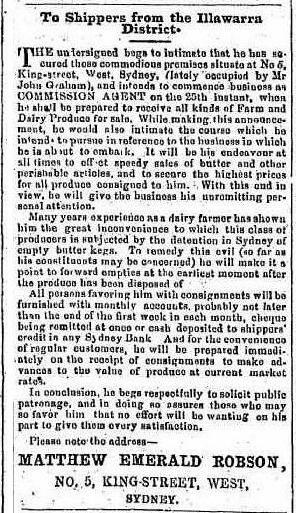 He started the Western Stores in outback country New South Wales, with a general store in nearly every large town in the state, and where better to orchestrate his growing business than Sydney? 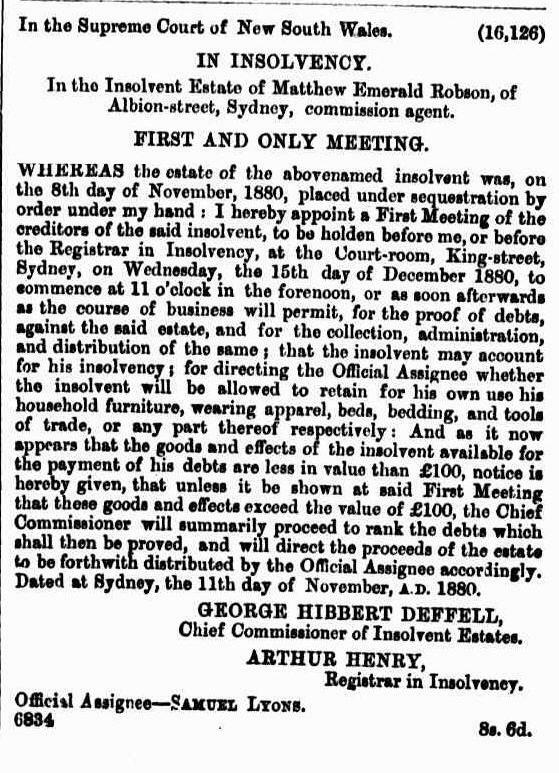 George moved his large family to Sydney and organised the orderly and very profitable distribution of goods by train to his stores, many of them managed by his brothers and cousins. George lived firstly in Paddington, where the last of his seven daughters Ethel Isabel Wise was born in 1890. He had one son Cyril Raymond “Kelly” Wise who managed the Wise properties in Gunnadah, before becoming a war hero in World War I, being honoured with a Military Cross and presented with the King’s Regiment Sword by King George V at Buckingham Palace, London. He served on the battle fields of Gallipoli and the Somme. My father was so proud of Uncle Kelly and was honoured when upon his death in 1967 that he was left Kelly’s medals. I am so proud to have inherited these from my dad and recently had them framed for posterity, still possessing the beautiful purple box that the Military Cross was kept. Funnily enough it was discovered separately from the medals in dad’s wine cellar, and a clever pair of eyes put two and two together to reunite the box and medals. George Wise moved his large family to Roslyn House in early 1900, a large and fashionable mansion in Croydon, Sydney. I think his wife, Agnes Amelia Wise nee Kilpatrick was a little like Mrs Bennet from Pride and Prejudice, and had a lot of pretty daughters to marry off. Mabel was married to W.E.V. 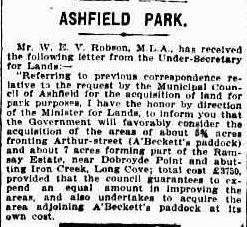 Robson, a successful lawyer and most prestigiously the new State Member for Ashfield in 1901, and William had built his new bride a magnificent home for the occasion. 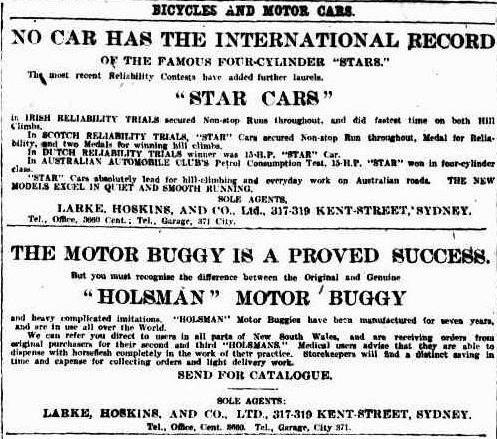 Another daughter Lily Wise married Richard Hoskins in 1905, a successful business man involved in establishing Larke Hoskins Motors with William Bain Larke. It is possible that this connection was the one that resulted in Mabel meeting W.E.V. Robson, who was a member of the board of Larke Hoskins. Another daughter Irene Wise married James Borthwick in 1912, heir to an hereditary baronetcy in England. 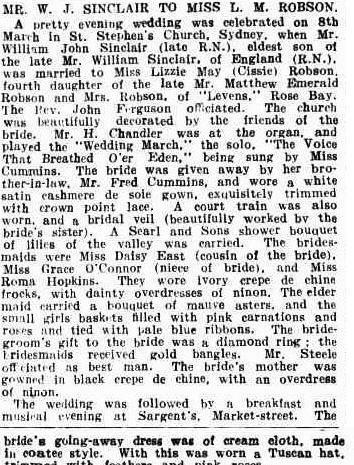 Another daughter Ellen married a wealthy Gilgandra, New South Wales farmer in 1895. Three other daughters, Edna, Ruby and Ethel remained spinsters, although one, Ethel Wise wore her engagement ring all her life as a tribute to her “beau” who was killed on the battle fields of World War 1. As I see it, George Wise was a very happy man, successful in business and very happy in his family life. George Wise had made so much money that he then pursued his favourite pastime, touring on the great White Star Liners of the world, visiting every continent, taking various family members on his voyages and of course, travelling first class all the way. 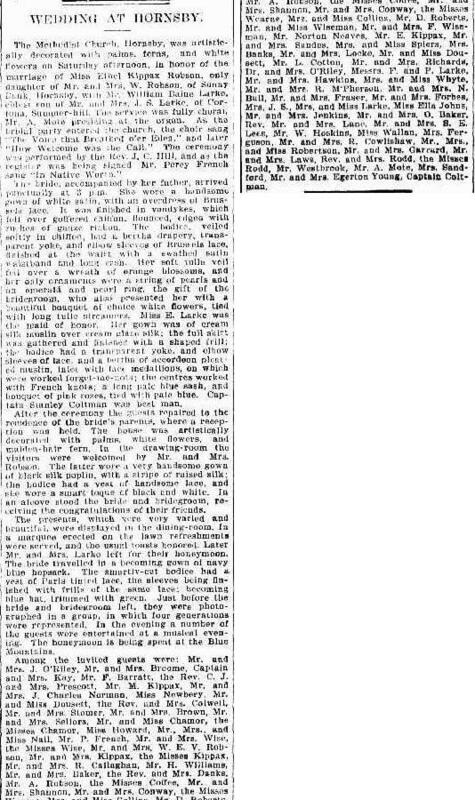 He even at one stage had a newspaper column reporting on his adventures, which were most entertaining and interesting. 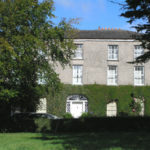 I will expand on all this in a further chapter called George Edwin Wise and the Western Stores, two previous chapters already written and uploaded to my website are called The Wise Family of Avoca, Victoria and The Wise Merchants of Cork. 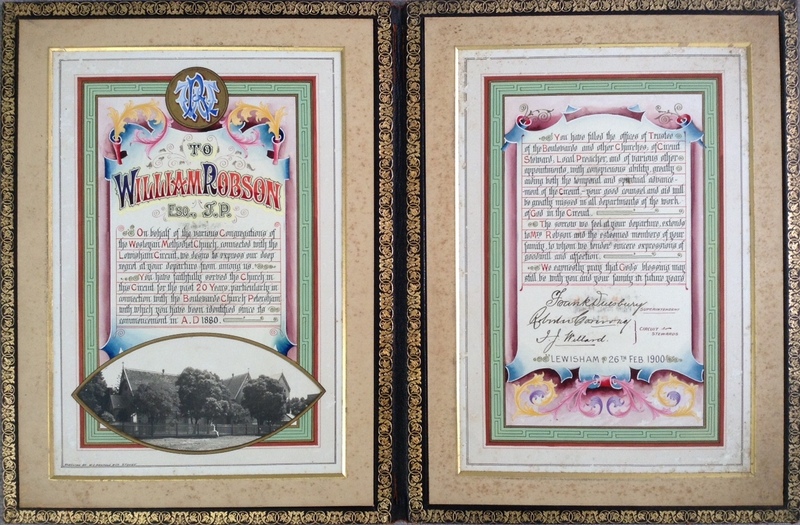 William and Mabel welcomed the birth of a son on 1 January 1903, William Alan Veitch Robson was a much-loved addition to the Robson’s new home in Ashfield. Another son Ewan Murray Robson was born on 7 March 1906. A daughter Kathleen was born 23 January 1908. My father Reginald George Robson was born on 31 March 1915. Dad used to tell us that he was born on the kitchen table in the family home in Ashfield. I presume that the kitchen would have been set up like a hospital by the doctor and midwife. It was a safer option than hospital which was only for the gravely ill. Dad also tells the tale that his mum, after going into labour desperately wanted the baby born before midnight. She didn’t want an April Fool! This newspaper was damaged and it took me ages to find Reg’s birth notice. 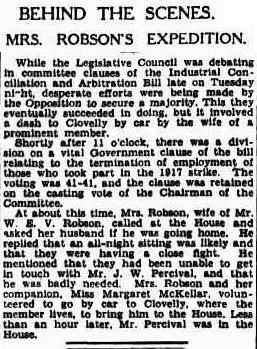 It was wonderful to see this clipping about Mabel Robson and to see that she had thrown herself into community duty as the wife of the Local Member for Ashfield. 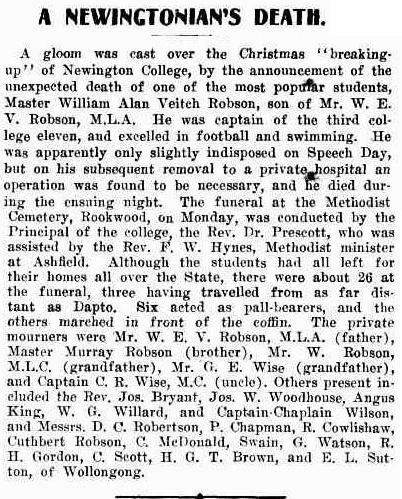 The earliest memory my father had was one of tragedy, when his brother William Alan Veitch Robson died while attending Newington College in December 1919. Dad would talk to us about Alan’s death from a burst appendix, and recollect how much it affected his parents. His mother in particular blamed Newington College for ignoring the signs of serious illness at the end of term time, when they passed it off as an upset tummy. 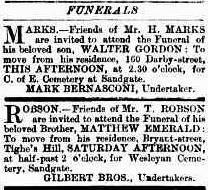 It was so sad for me to collect these death and funeral notices for Alan Robson, and see his funeral cortege left from his Grandfather, Mr G. E. Wise’s home, Roslyn House, Croydon. 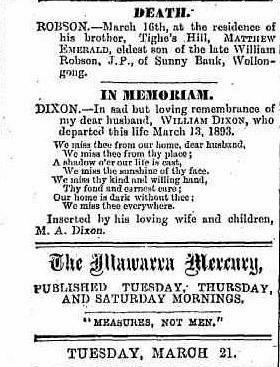 William was buried at Rookwood Cemetery in a grave that he later shared with his parents. 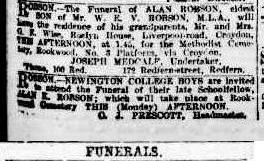 A long family tradition of Robson sons attending Newington College was broken following the death of Alan Robson. 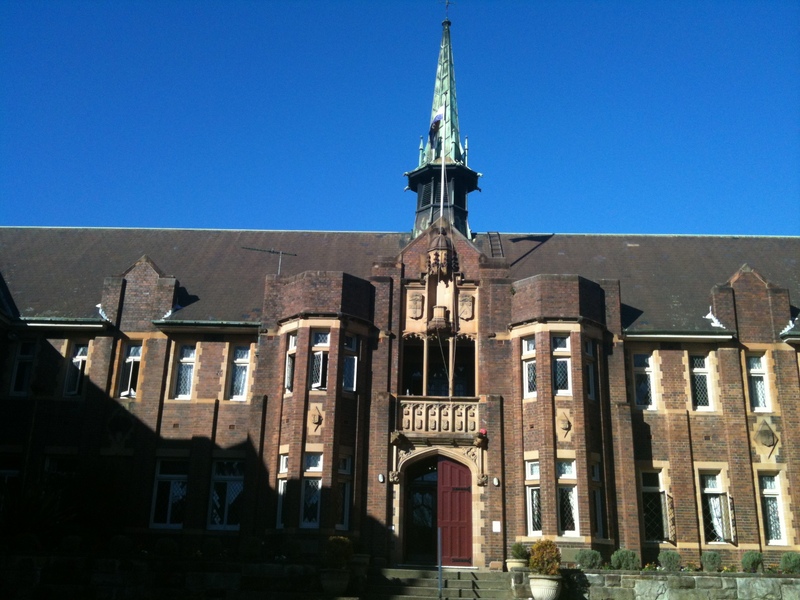 When the time came for my father to attend school, he was sent to Cranbrook Junior School, and then sent to board at The King’s School, Parramatta, an Anglican School. It would seem that my grandmother, an indomitable lady, had her way with her youngest son, my father, Reginald George Robson, and would not enrol him at Newington. Thus, my father also later broke with the Methodist Church and became an Anglican by religion. It is possible that W.E.V. 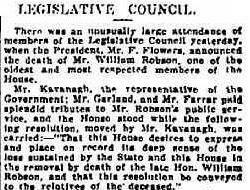 Robson’s resignation as the State Member for Ashfield in 1920 was in some ways a reaction to his son’s death. He must have been shattered, and possibly needed to spend more time with his family. 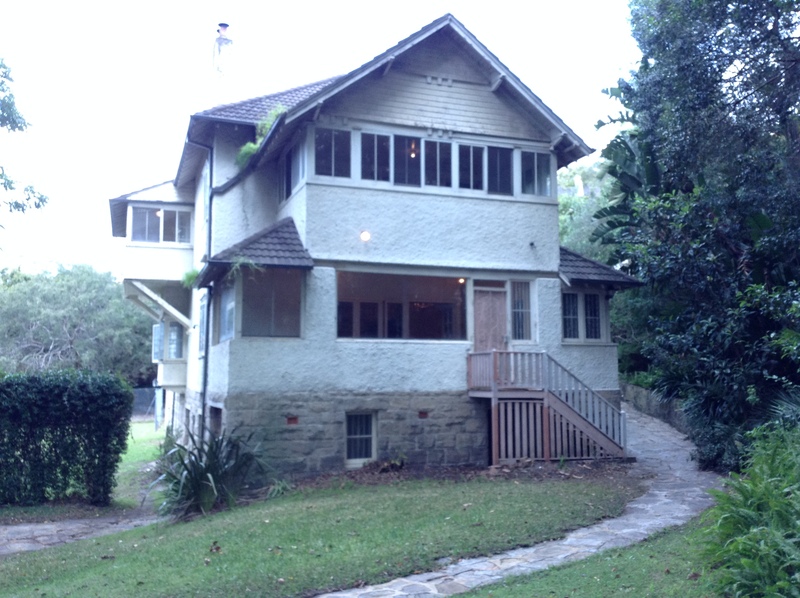 The year 1920 was certainly one of change for the Robson family who also moved to Sydney’s eastern suburbs and after a short time living in Darling Point, the family settled in Drayton, in Cranbook Road, Rose Bay, where they lived until W.E.V. 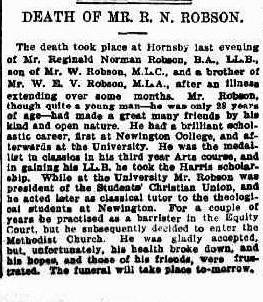 Robson’s death in 1950. Drayton came up for sale in 2016 and my sister, Lavinia and I went along to see Dad’s old home for the first time. Neither of us had ever been inside, we had just driven up the road and our dad had always pointed it out, so we were so familiar with it. Dad told us that he spent many hours in the downstairs games room playing snooker, and we loved to see that room that he had so often spoken about. He told us stories about the depression years when his mother Mabel had organised for soap to be made in the basement. Dad used to take a wheel barrow down to the Chinese Market Gardens in O’Sullivan Road, Rose Bay where he would load the barrow and return with fresh vegetables. The depression years were a difficult time for so many families. 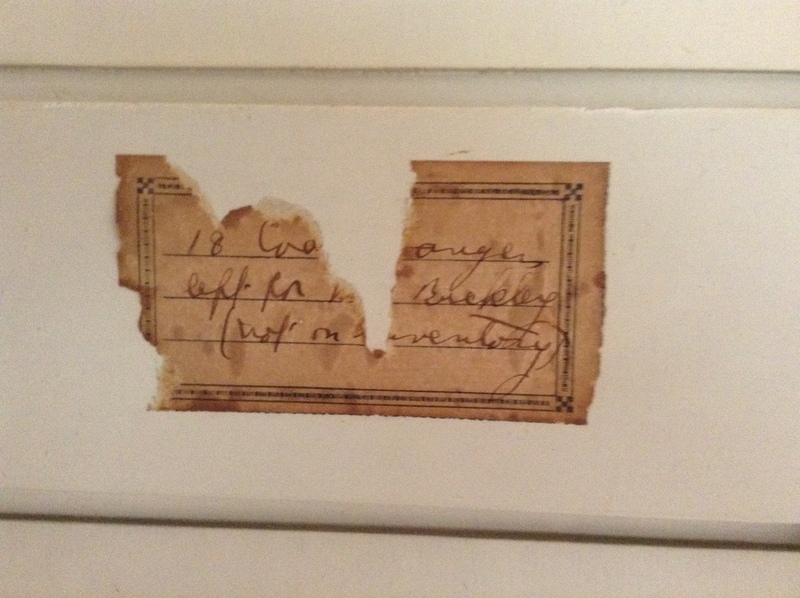 In a cupboard, upstairs in the old house we opened an old built in wardrobe and discovered a label written in my grandmother’s unmistakable handwriting and we surmised it was left by her for the tax assessors who had gone through the house valuing it for probate and death duties. In those years everything was taxed, though possibly not coat hangers, however Mabel was a perfectionist and it was lovely to see this relic of the past. Image courtesy of Ann Loveridge Collection. W.E.V. 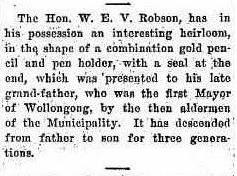 Robson’s father and mother both died in 1920, and his father was actually staying at Wollongong, in his son’s holiday home, Stella, when he became ill in October, and was also hospitalised and operated on to remove his appendix. 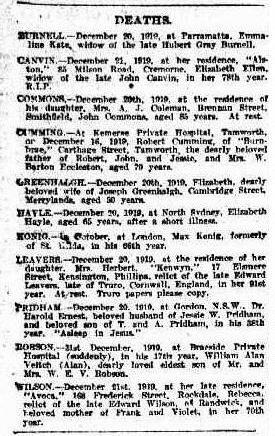 It must have been a terrible shock for the Robsons, and my dad at the age of only five could remember the family being plunged into mourning, only a few months after the death of his grandmother, Annie Robson. 1920 was also the year that W.E.V. 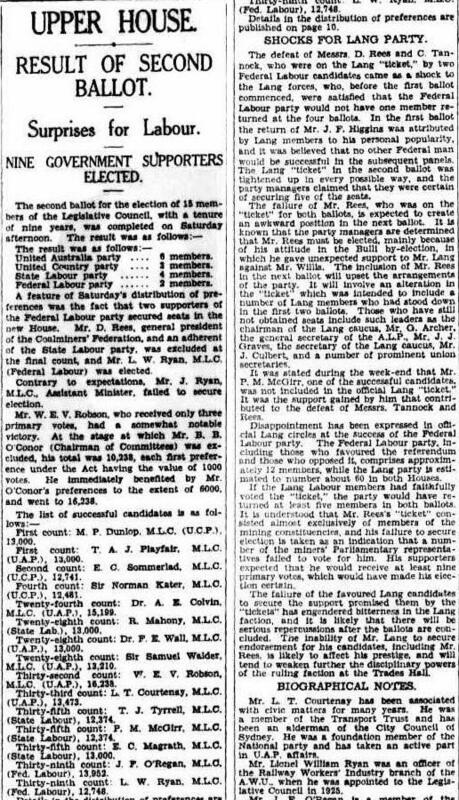 Robson took up a casual vacancy in the Upper House of New South Wales, becoming an M.L.C., like his father before him. 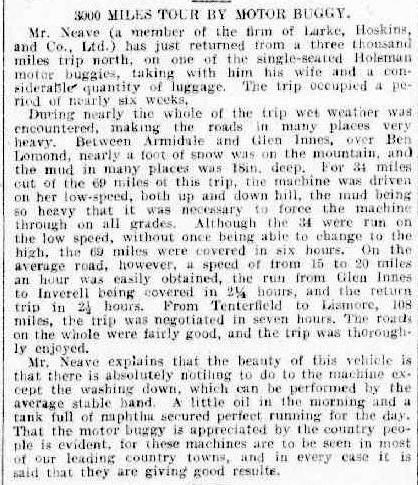 It was exciting to read about this cross-city adventure in the middle of the night for Mabel Robson who was recruited to dash to Clovelly and wake up a sleeping member, Mr J.W. 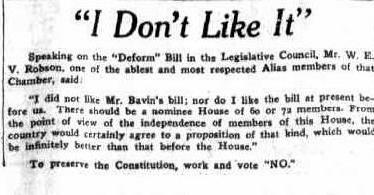 Percival, who was badly needed to vote in the house. Mabel achieved the objective in quick time and in less than an hour Mr Percival was in the House ready to vote. 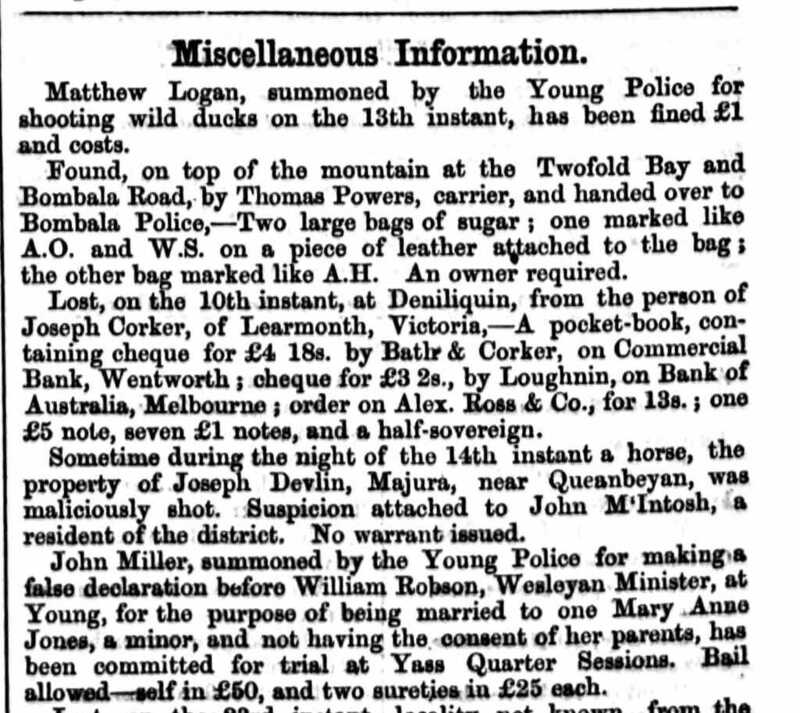 It is wonderful to find these little snippets of gossip in the old newspapers. 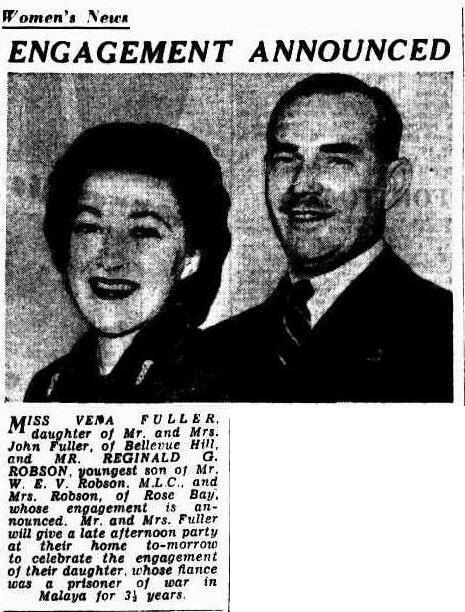 Post World War II was an exciting time for many Australians returning home to their families and loved ones, Reg Robson met Vena Fuller on the dance floor at Princes Nightclub a few weeks after he had returned from Singapore. 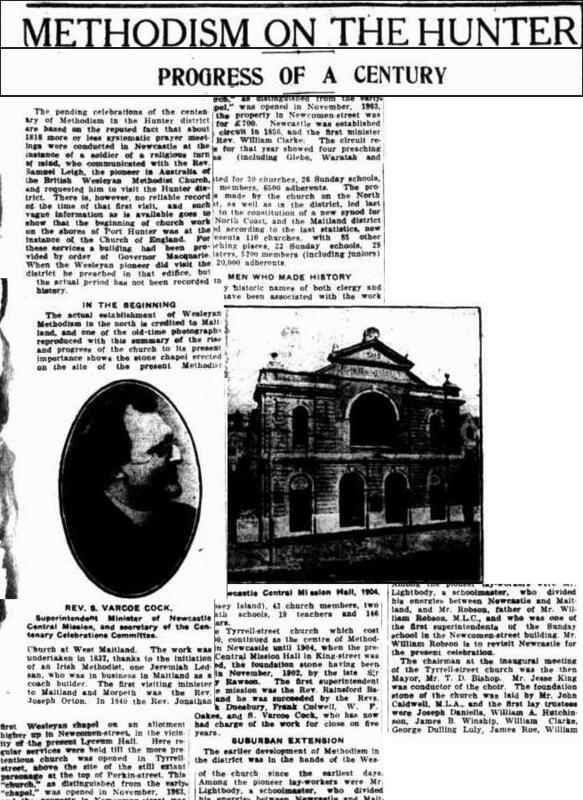 They were married at St Mark’s Church, Darling Point on 10 October 1946 and afterwards a large reception was held, with much celebration at Caerleon, Bellevue Hill, the home of the bride. In another chapter I will devote my Robson family history to the children of W.E.V and Mabel Wise and expand on the war years. 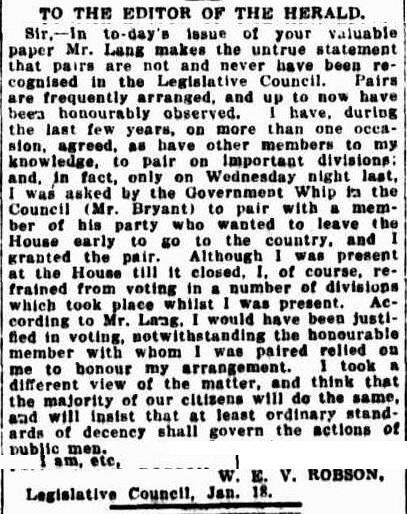 Ewan Murray, another son, who was the Member for Vaucluse in the New South Wales Parliament gained special dispensation to serve in the armed forces overseas and he distinguished himself in Africa and Borneo and rose to the rank of Lieut. Colonel, and received much acclaim as a war hero. Mabel was a widow for 20 years before her death in 1971. She moved out of Drayton shortly after 1950 and lived in The Chilterns at Rose Bay just opposite The Pier and had a lovely view over the promenade and waters of the Bay. Dad would visit his mother every Sunday morning and often take us for visits. My memory of my grandmother though was of a very old and frail woman with a walking stick. However, my research has uncovered a young Mabel and finding out about her married life and involvement in her community has been fascinating. 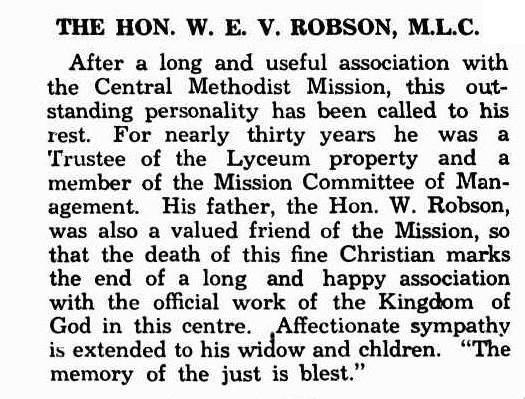 I can’t close this chapter without mentioning William Robson M.L.C.’s two brothers Matthew Emerald Robson and Thomas Robson who were considerable contributors to their community. Matthew Emerald Robson was born aboard the Emerald Isle on the Robson family migration to Australia. 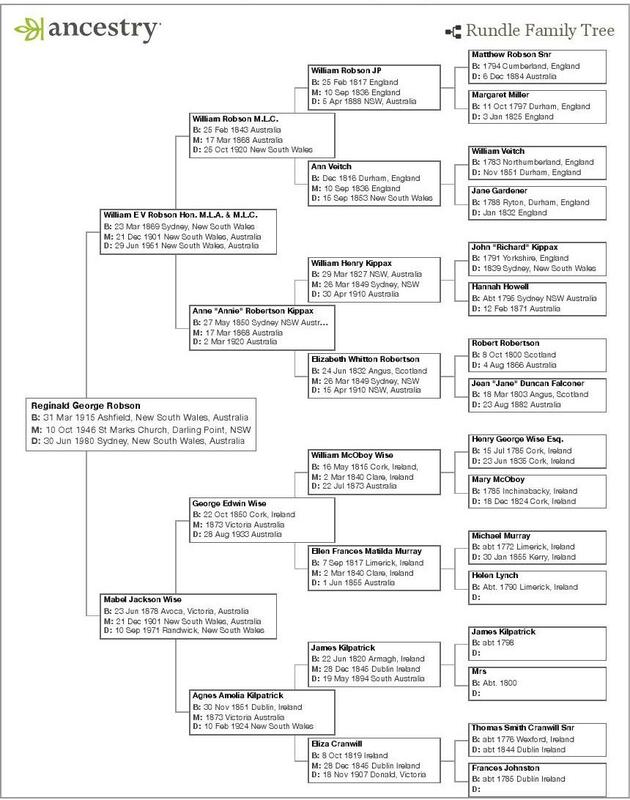 Some family trees state he was born on 11 September 1841 in the Bay of Biscay just shortly after the Emerald Isle set sail from Plymouth in England. 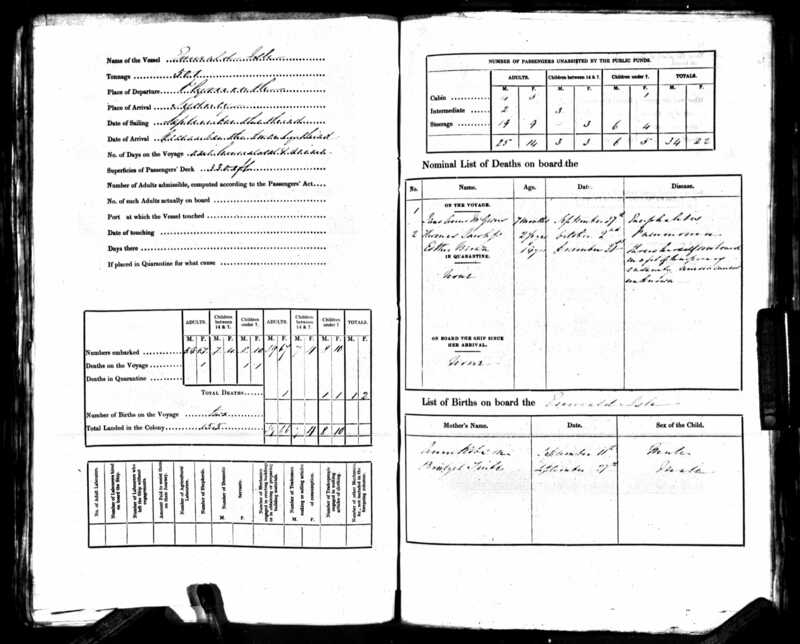 The only record of the Robson’s migration is that of the ship’s doctor recording in his log that a male child was born to Ann Robson during the voyage. 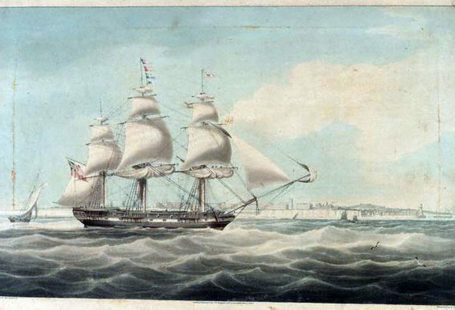 The Robsons, according to information lodged with Newcastle Regional Library arrived in Sydney on 23 December 1841, they caught another ship to Newcastle arriving on Christmas Day and they settled in Tighes Hill. Shortly after their arrival they had their son Matthew Emerald Robson baptised in Newcastle at Christ Church. Knowing that William was a staunch Methodist, it is possible that there were no Methodist churches in Newcastle at that time. 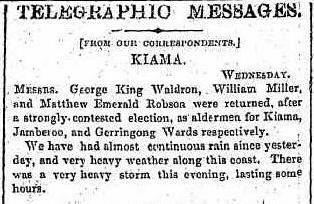 Matthew moved with the rest of the Robson family to Wollongong in the early 1850’s and in 1851 at the age of 18 years he married Ann Elliott, the daughter of James and Mary Elliott. I am not aware of any connection with William Robson’s second wife Margaret Elliott at this stage. Matthew Emerald Robson (1841-1899) and Anne Elliott (1840-1916) had a large family of four sons and five daughters, Walter William Robson 1860-1950, Adeline Emily Robson 1861-1960, Nina Robson 1863-1941, Annie Veitch Robson 1865-1954, James Watkin Robson 1867-1937, Arnold Taylor Robson 1869-1961, Edwin Arthur Robson 1872-1937, Lizzie May “Cissie” Robson1874-1958 and Florence Maude Robson 1877-1966. 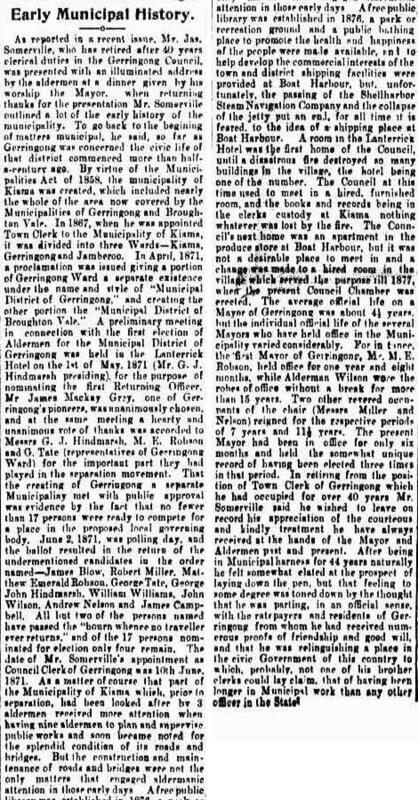 Matthew Emerald Robson was returned as a Gerrington Ward Alderman in February 1869, following in his father and brother’s footsteps in embracing community involvement. 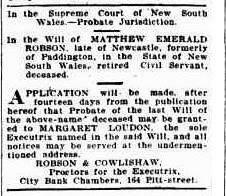 These Police Gazettes are a wonderful source of information, supplying both an address and occupation for Matthew Emerald Robson with the extra information that he had moved away from Wollongong and settled in Redfern, becoming a commission agent. This tiny notice I picked up from the Illawarra Mercury and it was a curious notice which pointed to Matthew having some sort of financial difficulties in Sydney. I have no doubt he was hoping and praying that his brother William and his family did not espy this newspaper snippet. However, there is always someone in a country town to find and seek these things and deliver bad news to the family. I am sure William would have been dismayed at his brothers bad fortune and helped if he had known. It came as a surprise to find this insolvency for Matthew Emerald Robson and I could see times were tough for him, and possibly due to his move away from the Wollongong area. The next record I collected came as a shock, however, when I read that his Gaol entry record was for desertion, my shock was tinged with disappointment and sorrow for his and his wife’s problems, and obviously one problem had led another. From the record Matthew complied with the judge’s order to return to his wife after three days imprisonment. It was nice to see that Matthew had kept in touch with his younger brother Thomas Robson who apparently had moved back to Newcastle from Wollongong, possibly to manage some of his father’s property there. It is recorded that William Robson acquired a fair amount of land around Morpeth and Tighes Hill. It was interesting to see Matthew’s sister Margaret Loudon nee Robson was the Executrix of his will and that his nephew W.E.V. Robson’s Law Firm, Robson and Cowlishaw were acting for Margaret. Thomas Robson was William and Ann Robson youngest son, who was born 13 December 1946 in Maitland, New South Wales. 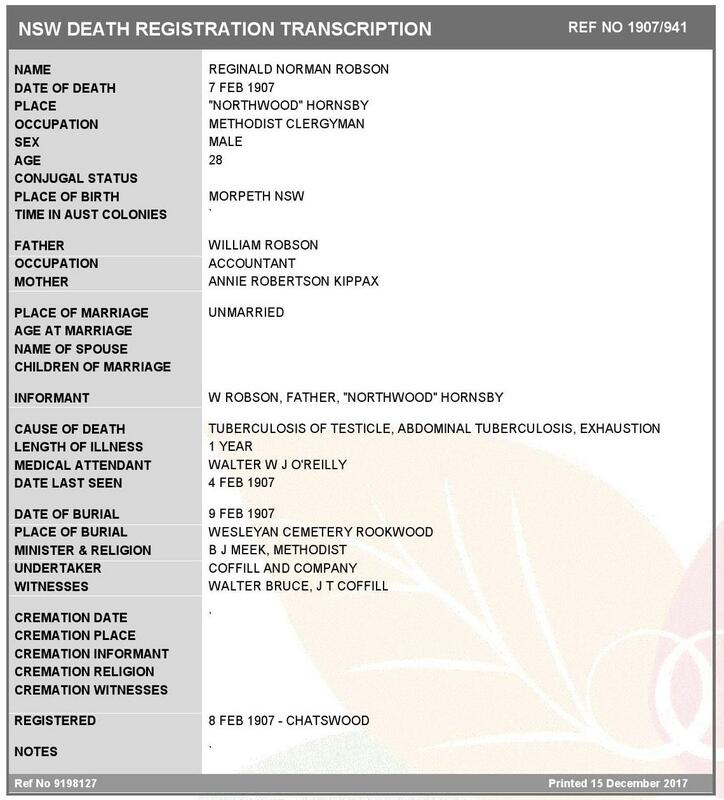 There is a discrepancy here between the birth record and family information, and it has been said that the isolation that the Robson’s were living in at the time near Morpeth may have precluded Thomas’ birth from being notified on time. 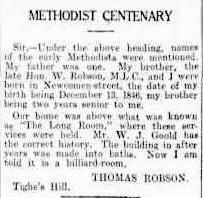 Thomas Robson (1846-1937) and Mary Ann Rossborough (1846-1905) also had a large family, Alexander Hillkirk Robson 1869-1882, Stuart Hamilton Robson 1871-1924, William Thomas Robson 1872-1873, Sarah Jane Robson 1875-, Emily Robson 1877-1914, Mary Ann Robson 1879- and Edwin Charles Robson 1881-1940. 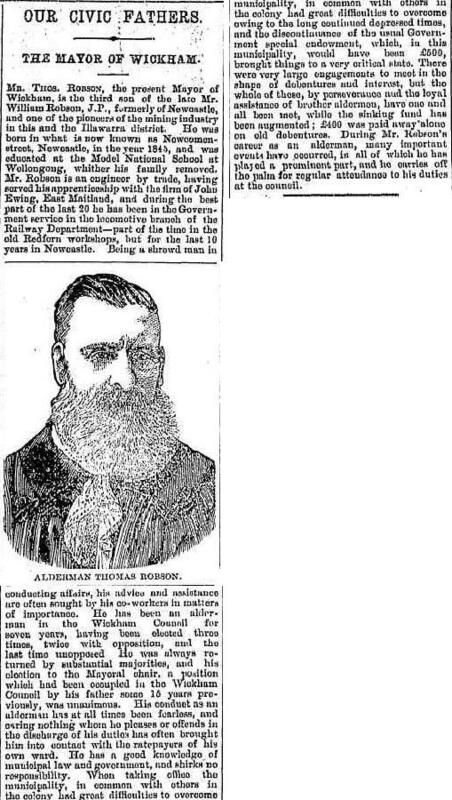 Again, clippings from old Australian newspapers gave me great insight into Thomas Robson, and I have had to rely on these documents because I have no family history that was handed down to me about him. When I first started my research in 2011 the Newcastle Morning Herald was not digitised, however, a return visit a few years later reaped rewards. Although not the earliest clipping I found for Thomas Robson, it was amazing to have this biography and newspaper portrait drawing to give an understanding of his life and times. 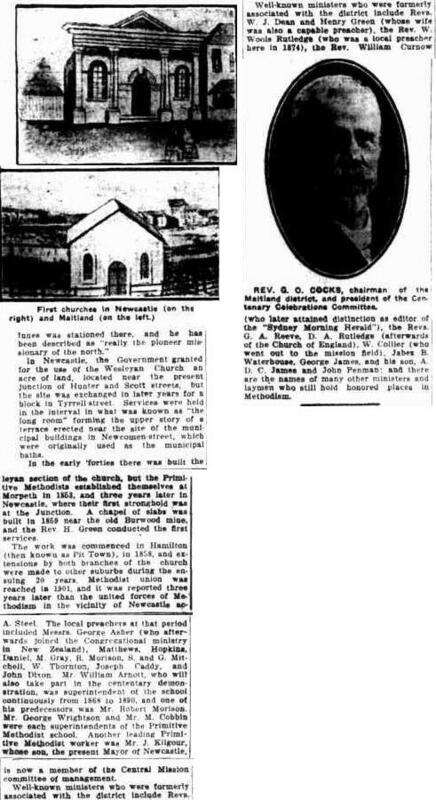 Thomas was another community minded Robson who also took a lively interest in history and was extremely proud of his family’s early involvement in the coal industry of New South Wales and the Robson’s early involvement in setting up Wesleyan Missions and Churches in both the Hunter and Wollongong area. 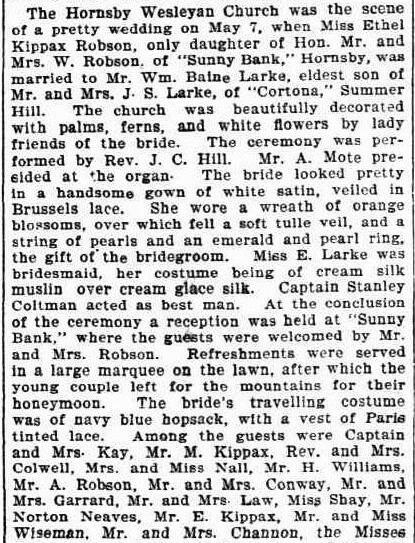 This marriage clipping for Sarah Jane Robson and Carl Wilson is wonderful and so very descriptive and gives so much information, two sisters Emily and Mary were bridesmaids. It was so sad to read about the death of Carl Wilson, the husband of Sarah Jane Robson after such a short time. I don’t know at this stage if Sarah Jane married again. 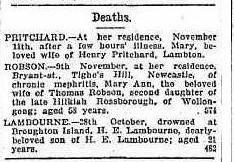 Mary Ann Rossborough died in 1905, but her husband Thomas lived to be 91 years old and died on 18 May 1937. 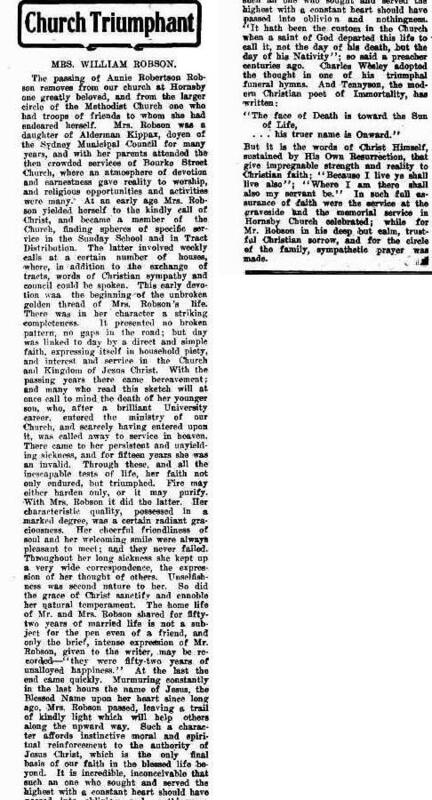 I was able to capture a wonderful obituary about Mrs Thomas Robson and it also contained the important information that Mary Ann Robson was buried at Sandgate Cemetery, Newcastle in the Methodist Section. 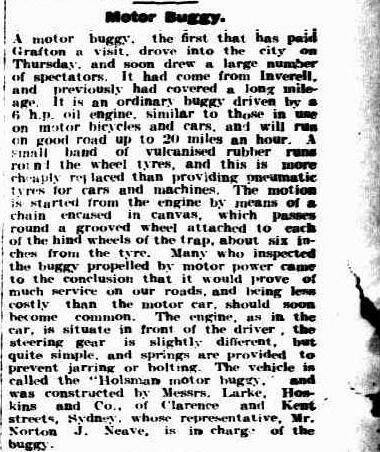 13 November 1905, Newcastle Morning Herald and the article was also picked up by the Illawarra Mercury on 24 November 1905. 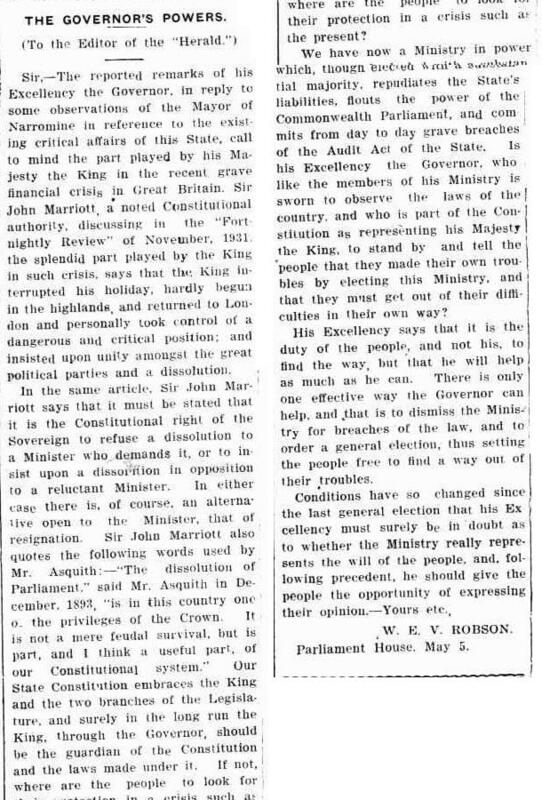 I believe it was this letter which spurred Thomas Robson to reply a few days later. 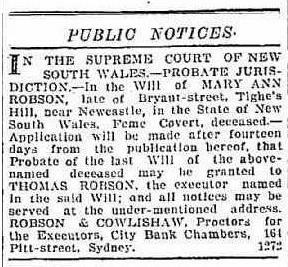 It was the newspaper Letters to the Editor clipping in the Newcastle Morning Herald regarding Thomas’ age that sent me looking at the NSW Birth Record for Thomas as I could see discrepancies in both this article and his death notices. 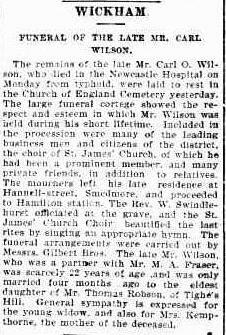 However, the most wonderful information was in regard to his recollection that he and his brother William Robson M.L.C were born in Newcomen Street, Newcastle. 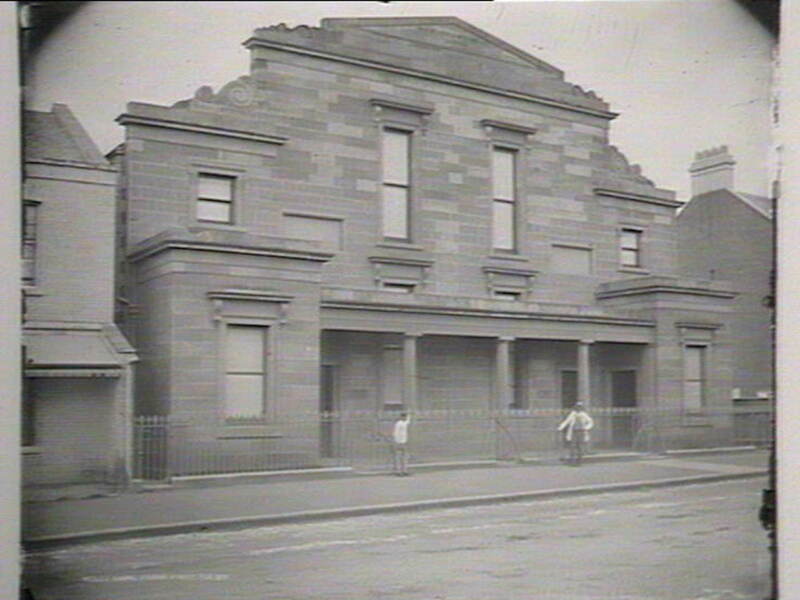 The Robson’s home being above what was known as “The Long Room” where Methodist services were held. It would be wonderful to try and find this address today, and see whether any of the old buildings survive – a bit of a long shot! Just as I was about to complete my research for the Robson family history an incredible piece of the Robson family puzzle came together. Since the start of my research I had long hoped to place Ann Veitch, William Robson M.L.C.’s mother’s back into her family in Scotland or England. The Robson Family History, written by Ken Robson states that Ann’s family came from Jedburgh, Scotland. 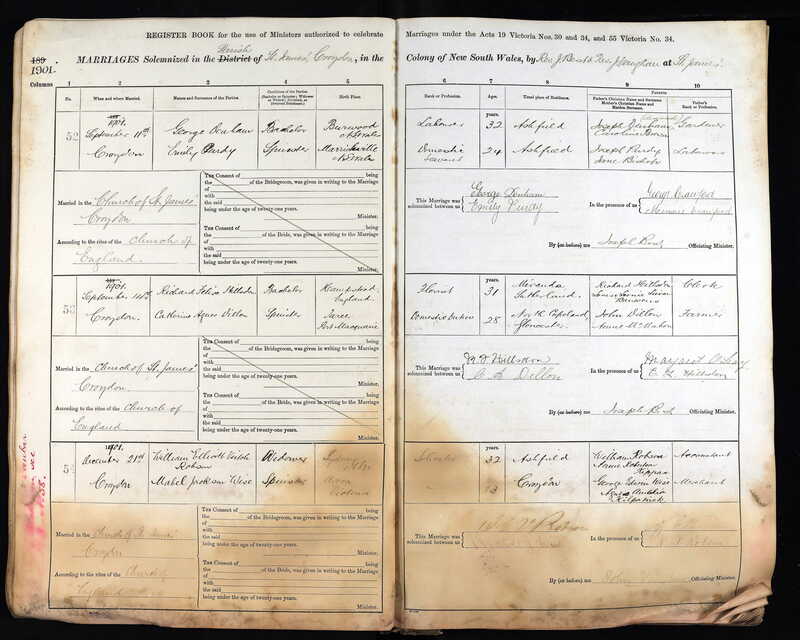 I had searched Scottish records for a Baptism for Ann without success, and knowing that the majority of people marry within their own parish area I decided to search records for a Baptism for Ann Veitch near to Wallsend and Newcastle upon Tyne. I found one Baptism that matched Ann’s birth date. This baptism for Ann gave so much information, Ryton is a small parish on the River Tyne and Bladon, or as it is known today, Blaydon, is a township close by to Wallsend where the Robsons had lived in England. Ann’s father William was a Keelman, a person who helped push the coal barges down the River Tyne towards the harbour at Newcastle where colliers were awaiting their load. This information tied the Veitch and Robson family to the coal industry as William Robson and his father Matthew were coal miners. Back in 2012 I had my DNA done by FTDNA for the Kilpatrick Project in an effort to find where my Kilpatrick family of Ireland had come from. Unfortunately, this connection was unsuccessful, however having paid and joined up my DNA remained waiting for another connection. 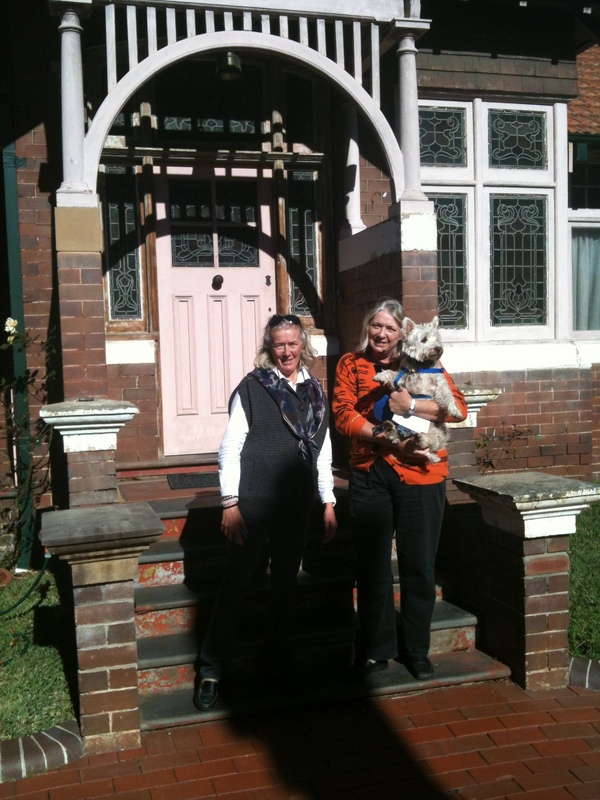 In February, this year, three members of the Veitch family who hailed from Mogo, New South Wales joined FTDNA. Incredibly I became a match for a 2nd-3rd cousin with all three of them. 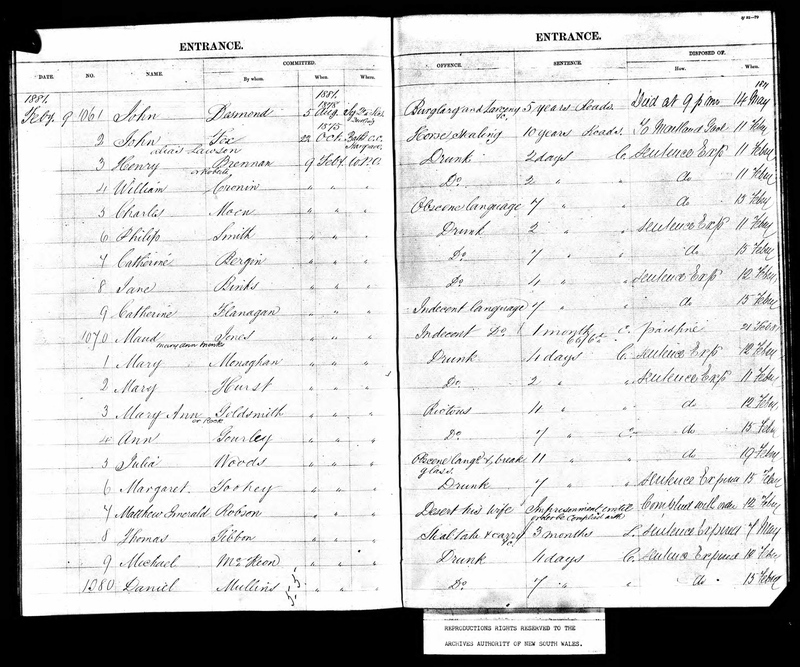 The information they provided about Mogo, New South Wales was so helpful, because I could see on ancestry that there were several family trees collecting information for a Veitch family whose ancestor George Veitch had migrated to Australia in 1854 and his records showed that he was not only from Newcastle upon Tyne, but he was a Methodist by religion. His birthdate indicated that he was a few years younger than Ann. A quick check of my records for Ann’s Baptism showed a younger brother George Veitch was baptised at Ryton Church, Durham in 1820. 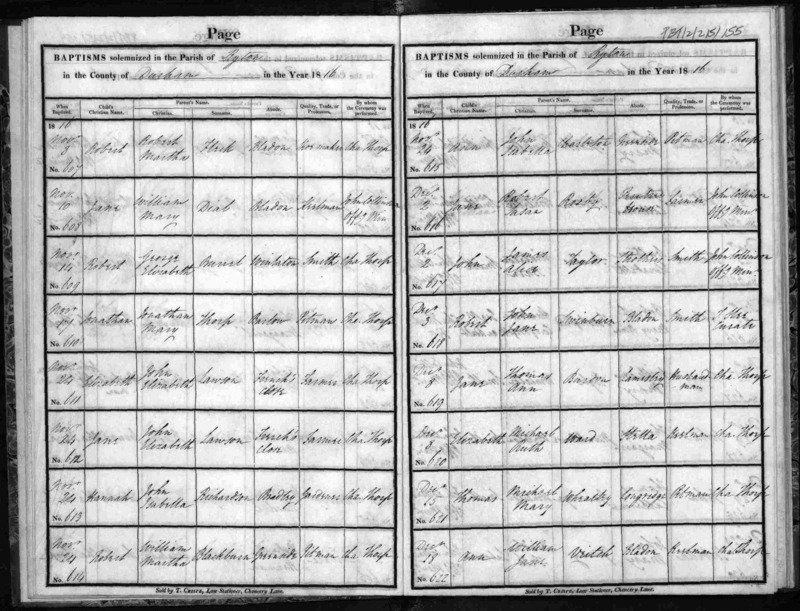 William Veitch (1783-1851)and Jane Gardener (1788-1832) had twelve children, Mary Veitch bap. 1805, Michael Veitch bap. 1809, twins William and John Veitch bap. 1811, Robert Veitch bap. 1813, Jane Veitch bap. 1815, Ann Veitch bap. 1816, Matthew Veitch bap. 1818, George Veitch bap. 1820, James Veitch bap. 1822, Samuel Veitch bap. 1824 and Thomas Veitch bap. 1825. 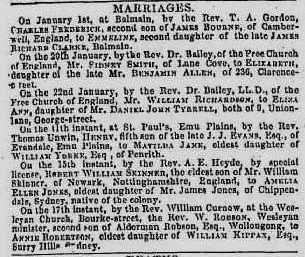 I had earlier found a marriage for a William Veitch and Jane Gardiner which I felt was correct for this couple, who were married at Ryton Church, County Durham, on 20 May 1805. I had all this information, yet I was still not confident that this was Ann and George Veitch’s tree, nor that they were indeed siblings. I knew I was somehow related by DNA to the Veitch family of Mogo, New South Wales, but the DNA does not deliver the connection. That is something that one has to establish through documentation. However, there was one more piece of the puzzle to come together to fulfil my inkling that I had found the correct family for my Great Great Grandmother Ann Veitch. This information would come from Mogo. It was a natural next step to make some investigations about George Veitch of Mogo. 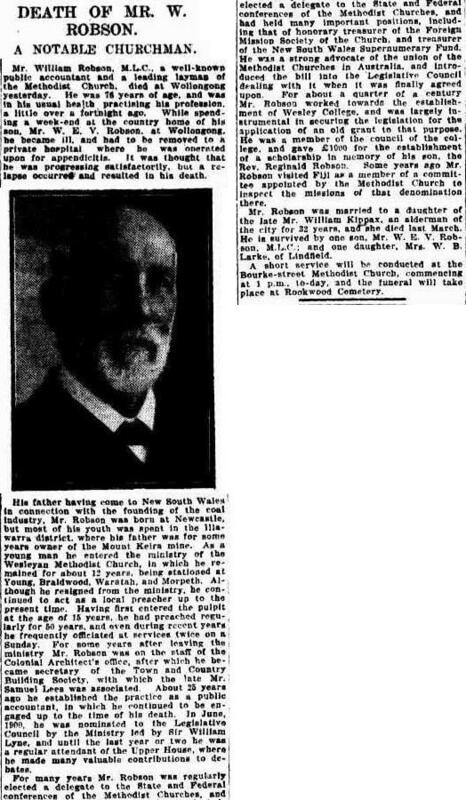 It is very possible that George Veitch had married in England before his marriage to Barbara Hall in Australia in 1868, it is also a fact that Barbara’s first marriage to her first husband, Mr Hall had broken down, and both had to wait until their first spouses died before they could marry again. George Veitch (1820-1873) and Barbara Meickeljohn (1833-1914) had a large family of nine children, James Gardiner Veitch 1856-1932, Isabella Anne Veitch 1858-1871, Mary Jane Veitch 1862-1863, Margaret Veitch 1862-1863, Albert Sydney Veitch 1864-1947, Eva Veitch 1866-1914, Ada Emily Veitch 1868-1937, Maitland George Veitch 1869-1925 and Frederick William Veitch 1873-1918. As can be seen six of the children were born before 1868 and obviously, George and Barbara were living in a strong family relationship well before their marriage. One of the more interesting pieces of information came from other ancestry trees who gave the eldest sons James the middle name Gardiner. Now, that was a name that interested me! A middle name for a first-born child would probably indicate a grandmother’s surname. It was exciting to see. It was disappointing to collect the Australian Birth Index and find no middle name was given. However, the very next document I collected included his middle name Gardiner. 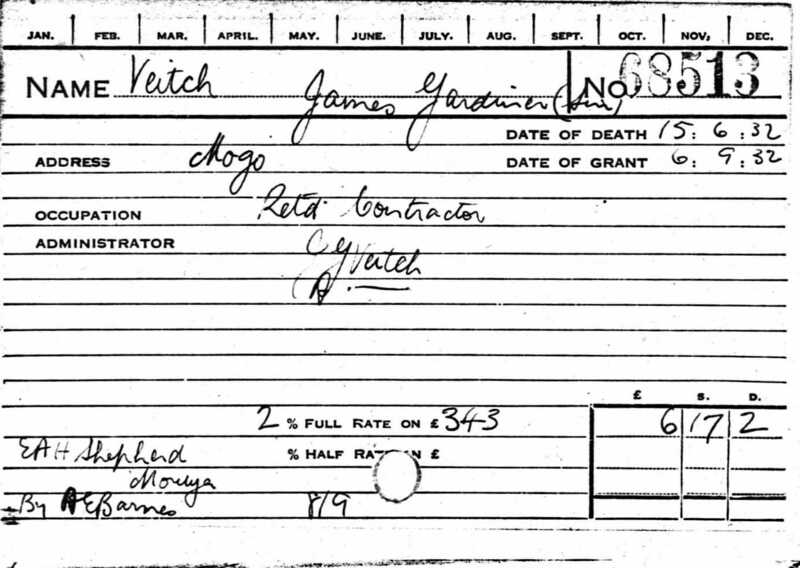 This cemetery record for James helped to connect me to several Veitch Family Trees on ancestry. Attached to several trees was a headstone for James Gardiner Veitch of Mogo, New South Wales, which came from the John Kendall in Barling/Kay Cahill Tree, who kindly shared her photograph. 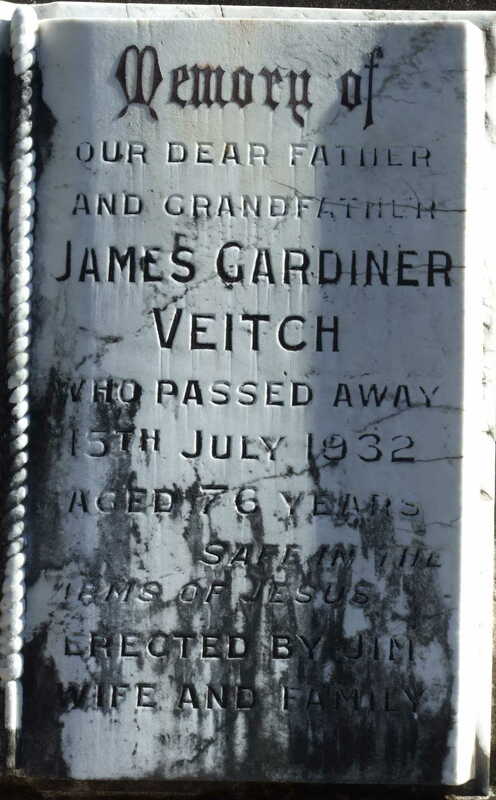 James Gardener Veitch is buried beside his wife Elizabeth Veitch nee Annetts, who died on 20 July 1922, aged 63. The information about the Veitch family of Mogo has been very exciting to research. 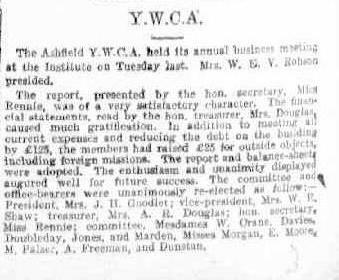 I was delighted to find the family connection for Ann Veitch. Her death at the young age of 36 years has haunted me for so long. I worried about her dying in outback New South Wales, tragically leaving a young family for her husband to rear. I hope she didn’t have any doubts about the Robson family leaving Northumberland for Australia. Ann Veitch’s legacy has been passed down through the generations, and her surname given to my grandfather, among many other Robson descendants, she has a very special place in our hearts. I would also like to thank my sister, Lavinia Chrystal, for all her help on our many excusions and for her enthusiastic editorial scrutiny. I would like to dedicate this chapter of the Robson family history to my sister. Lavinia is definitely a wonderful researcher in the field, and it is wonderful to have a companion, especially when visiting cemeteries; whilst they are magnificent places, it is not somewhere I would like to go alone. 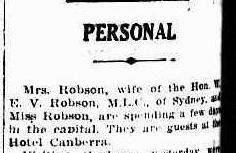 My next Robson family chapter The Robson Family of Sydney 1930-1960 will complete the trilogy. What a great job you have done on this site of the Robson Family. I am only related by marriage but no children as Margaret Robson married late in life to John Loudon.